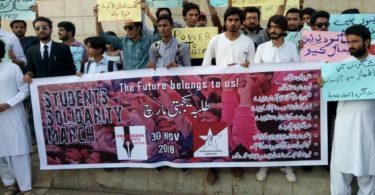 Scores of students from public and private universities marched and staged a sit-in on a range of demands related to higher education on Friday, 30th November 2018. 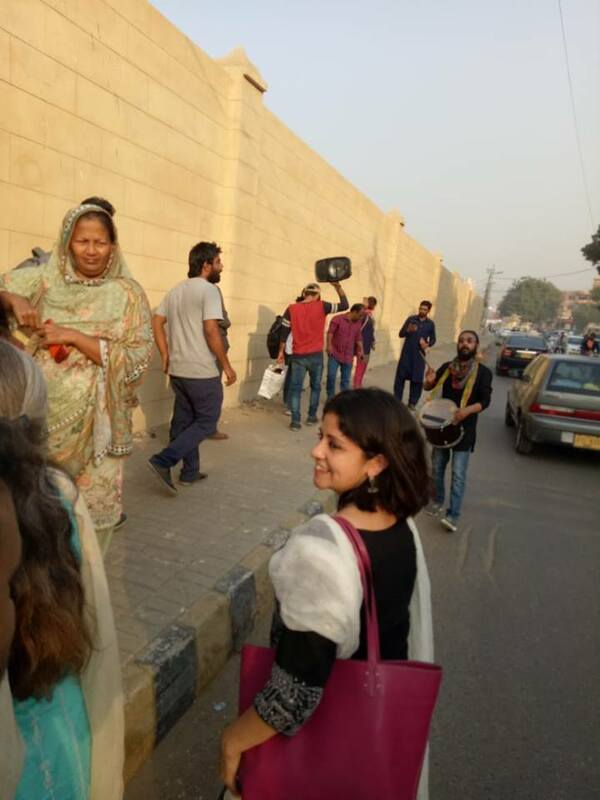 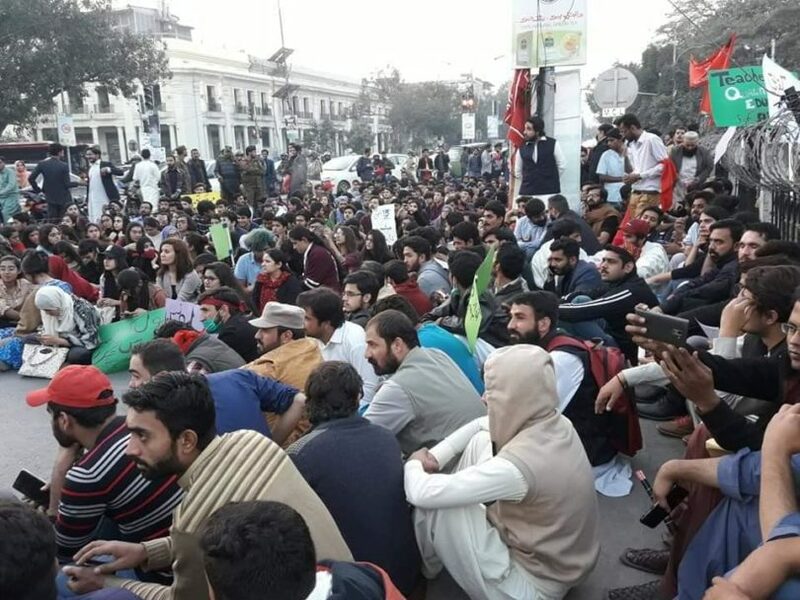 The protestors in Lahore peacefully marched from Istanbul Chowk to Charing Cross on The Mall without causing any roadblocks. 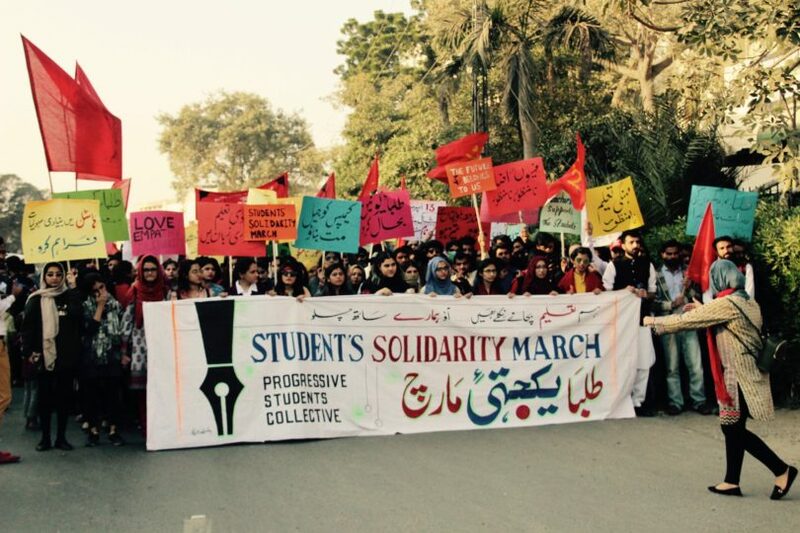 The Students’ Solidarity March, organized by Progressive Students Collective (PSC), started at 2 pm. 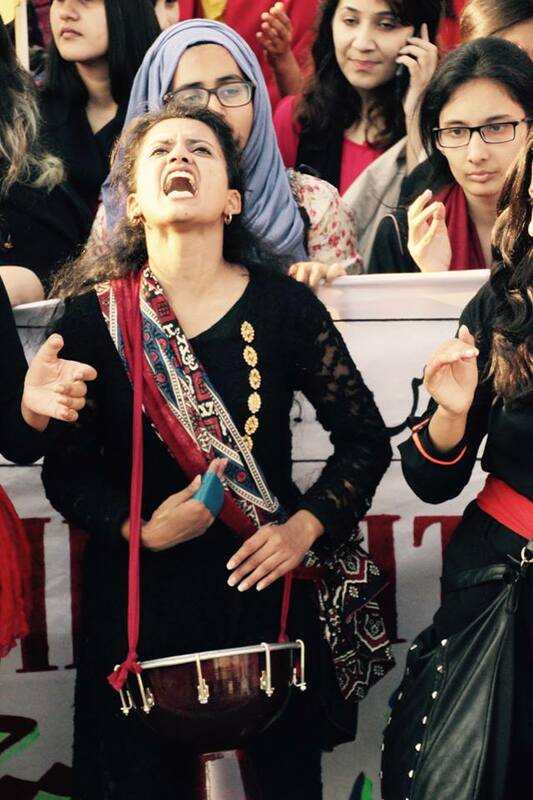 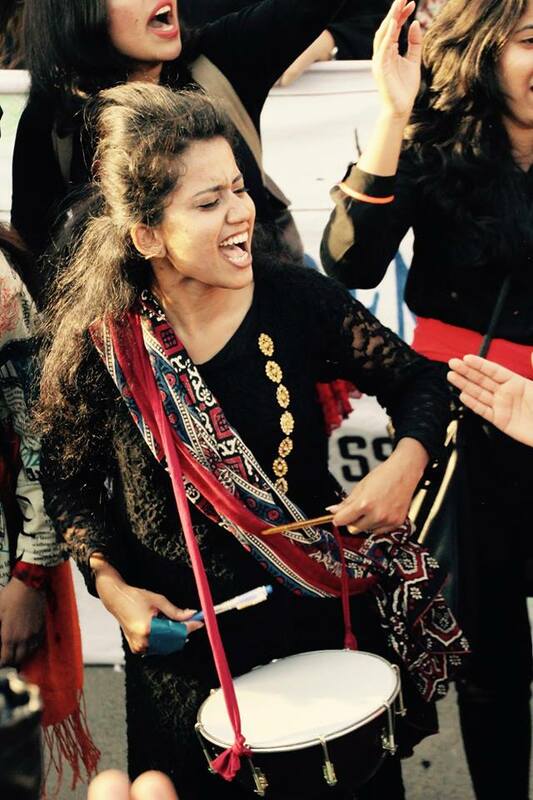 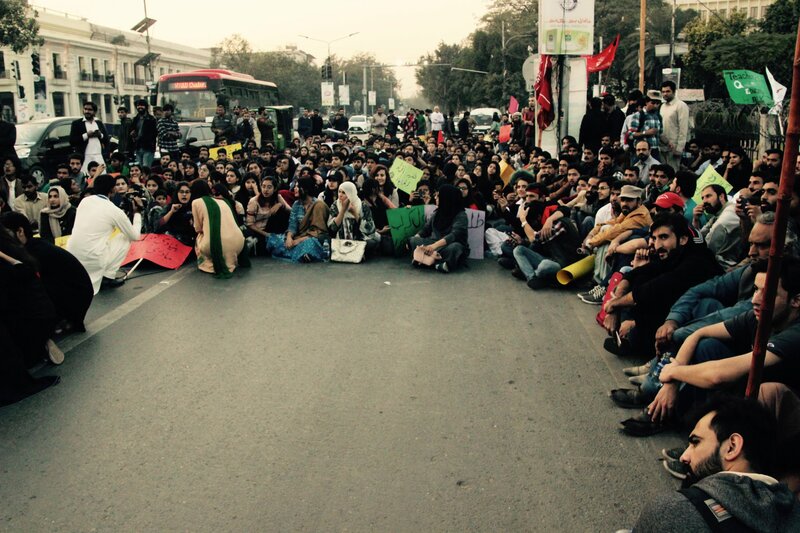 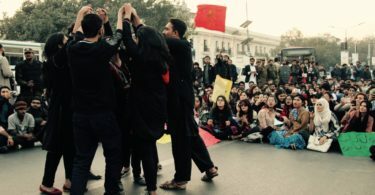 Chanting slogans, the students gathered at Charing Cross where they presented their demands. 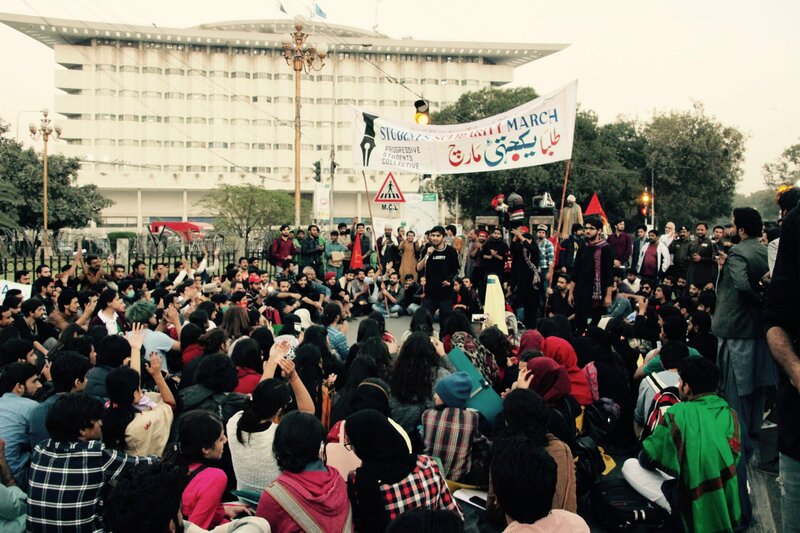 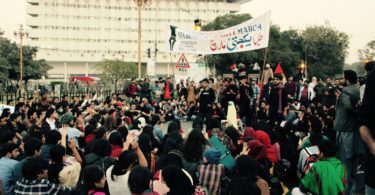 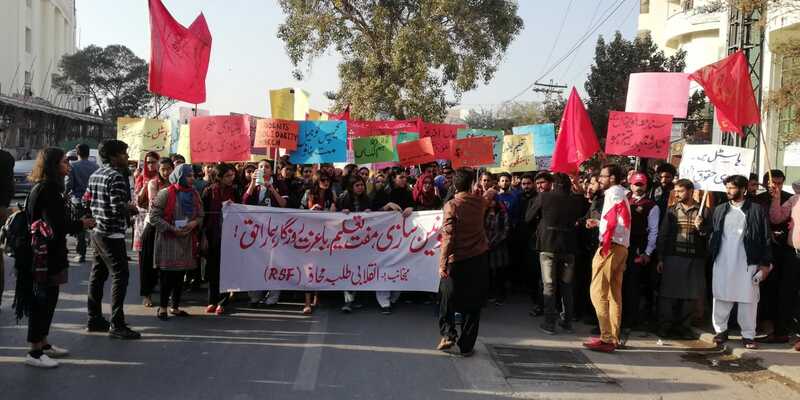 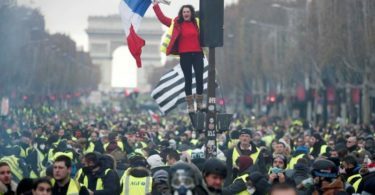 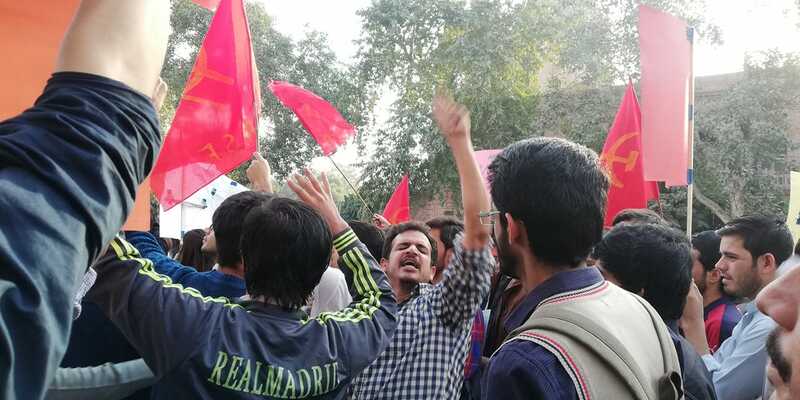 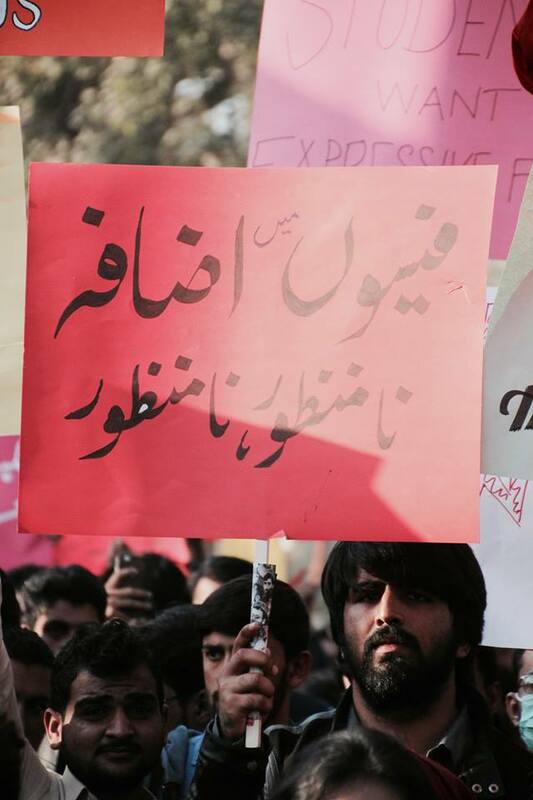 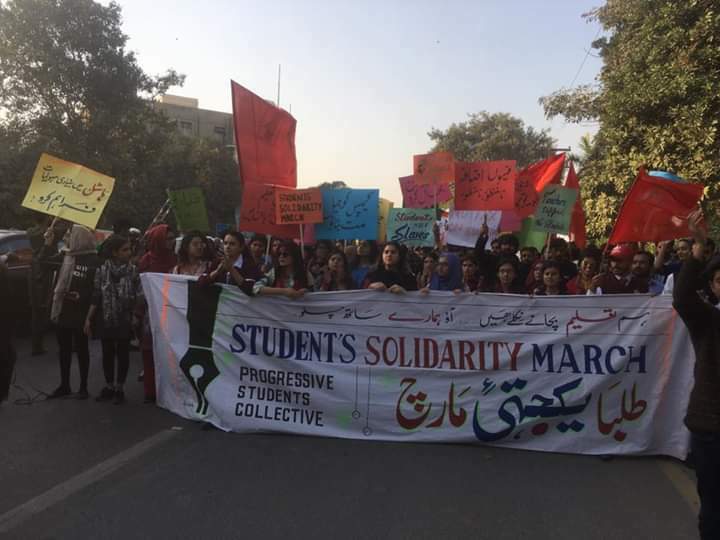 Revolutionary Students Front (RSF) and other progressive student organizations and councils from different educational institutes participated in the march. 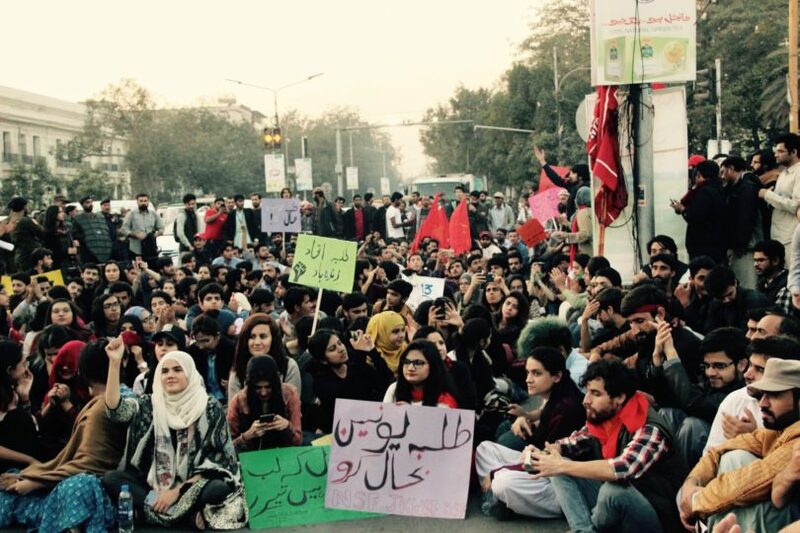 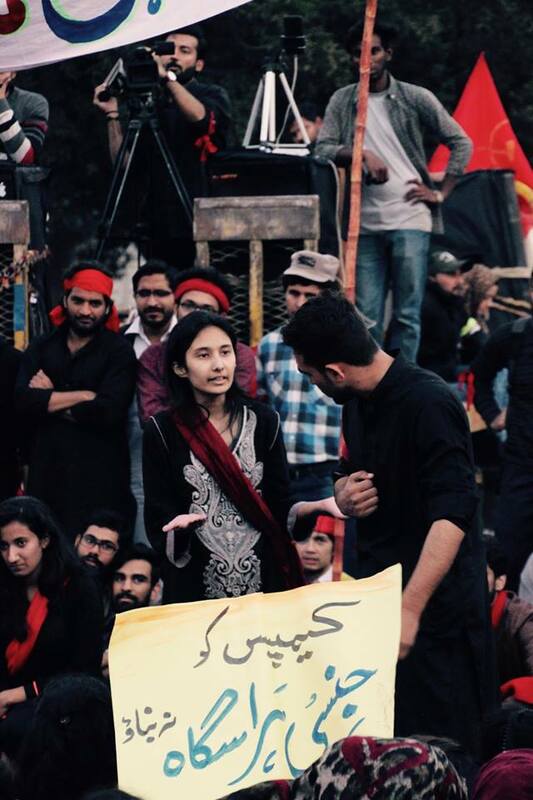 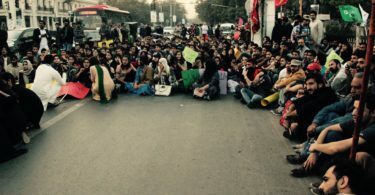 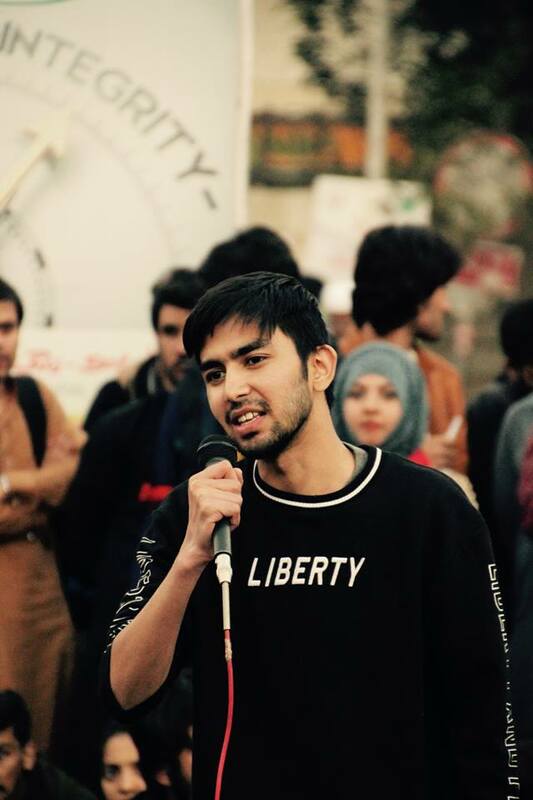 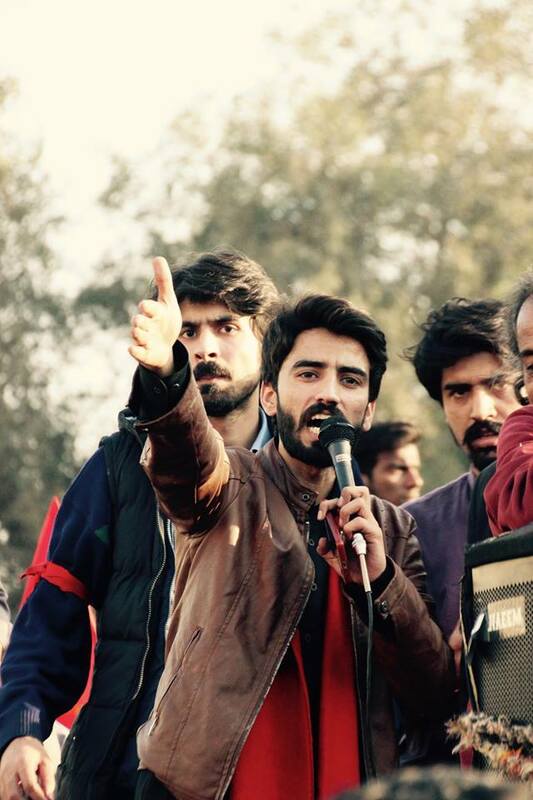 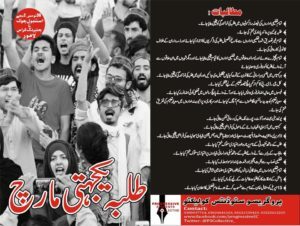 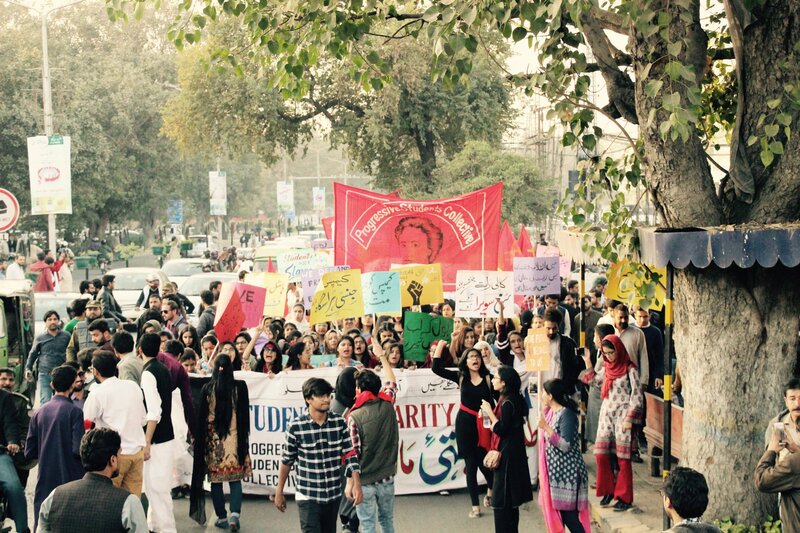 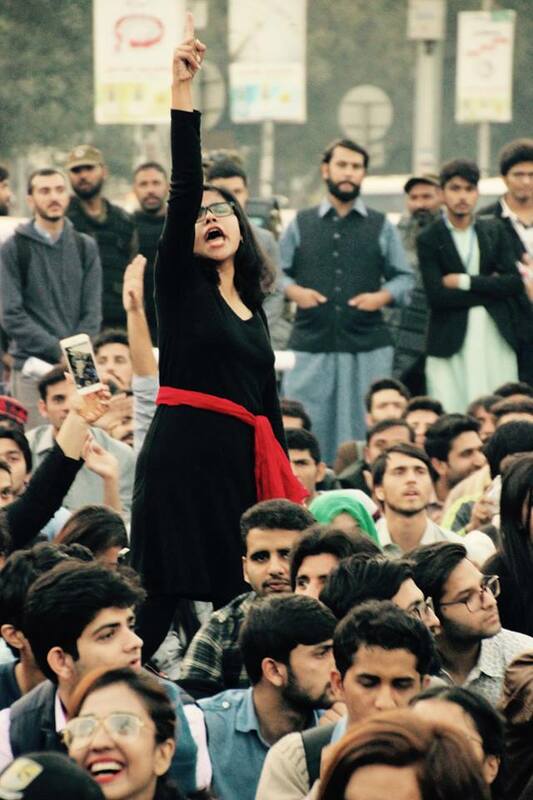 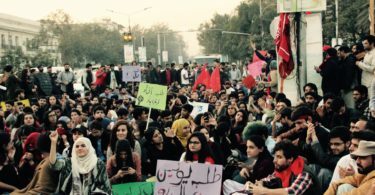 The students’ Charter of Demand includes student representation in decision-making on campuses, restoring student unions, issuing degrees to enrolled students, increasing quotas for out-of-Punjab students, functional sexual harassment policies on campuses, increasing the budgetary allowing for education to 5% of GDP, freezing the fee hikes, and improving the quality of teaching and research. 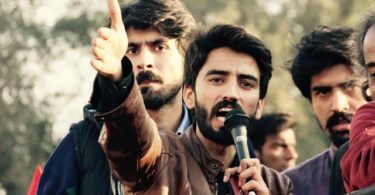 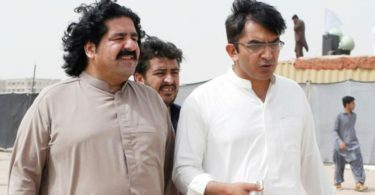 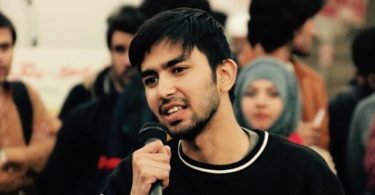 Speaking at the occasion, student leader Muzamil Khan said, “The reduction of quotas for Pashtun and Baloch students is unacceptable as these students come to Punjab due to a lack of universities in their own areas. 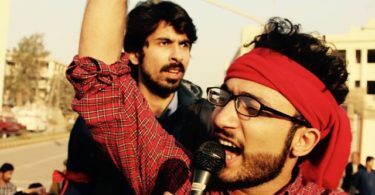 Moreover, all FIRs registered against student activists that label them as terrorists need to be withdrawn“. 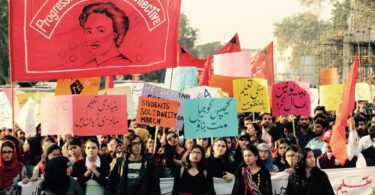 Women’s Collective student organiser, Zammon Saleem, argued that functional sexual harassment policies on campus are essential to ensure they can focus on their studies free of the trauma of harassment. 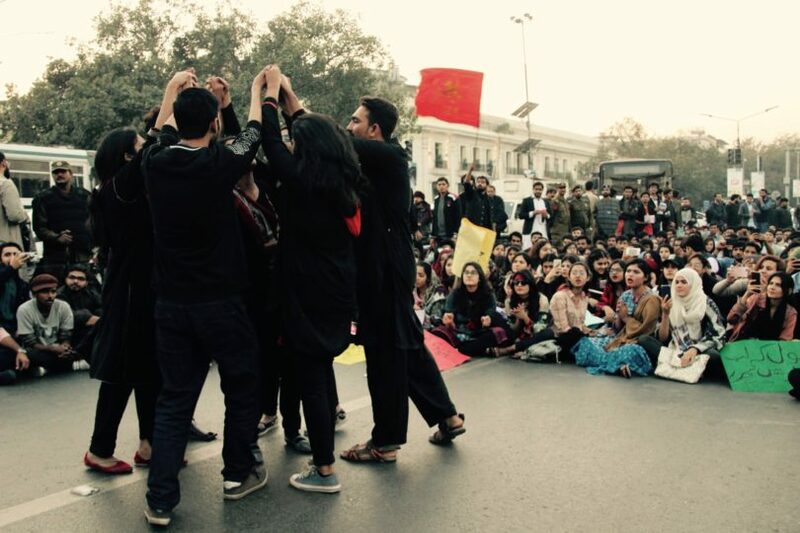 Azad Fankaar performed a marvellous play focusing on the problems that every student face. 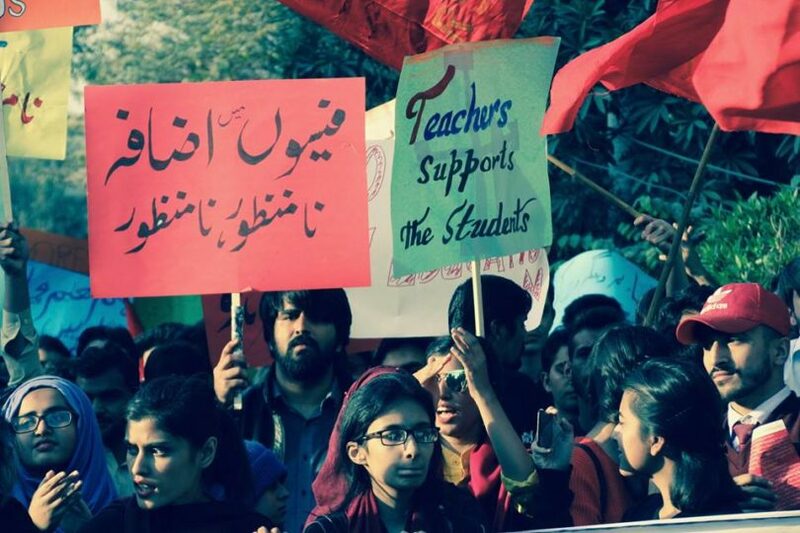 Teachers from private and public sector universities were also present. 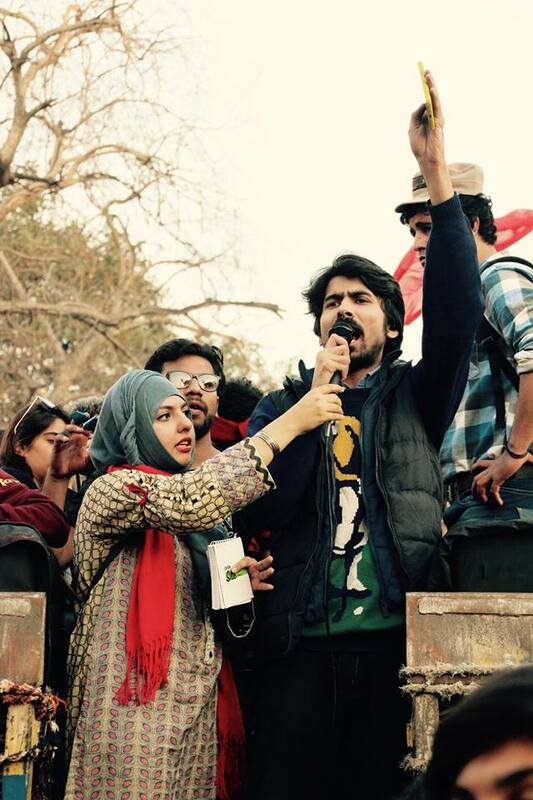 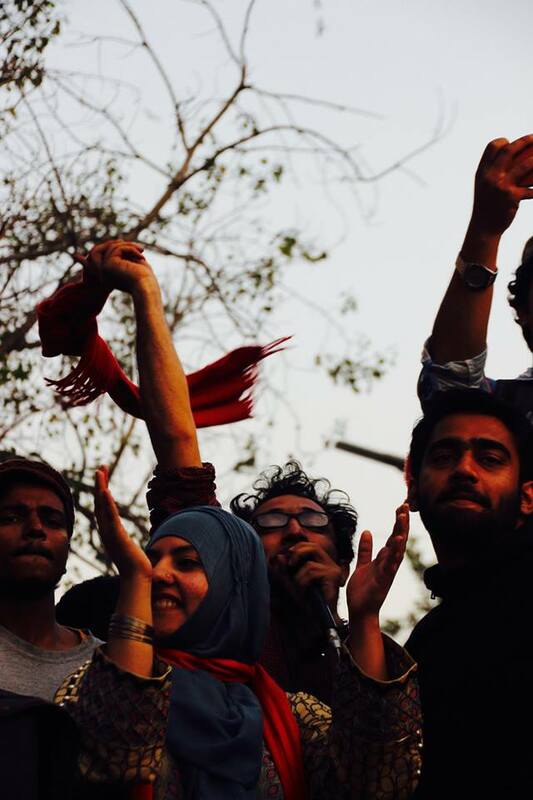 They expressed support for the students’ campaign and endorsed their demands. 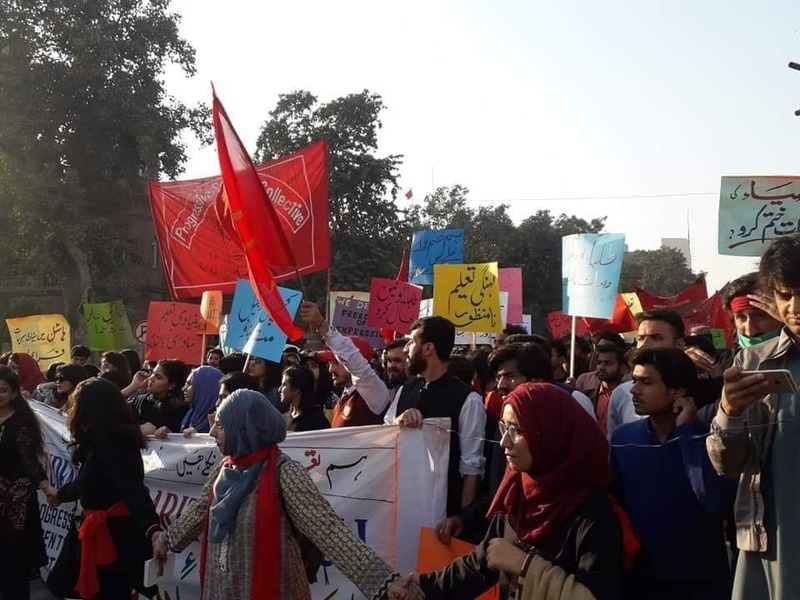 Speaking at the occasion, academic Aimen Bucha said, “The real problem lies with the education sector and its structure and not individual university administrations. 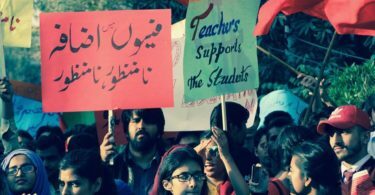 The economy needs to be structured and planned in a way that should facilitate quality academic learning through quality higher education institutions”. 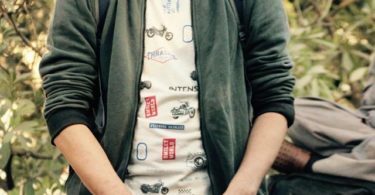 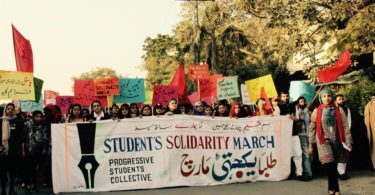 As part of their campaign, students have been mobilizing across campuses for the one last month. 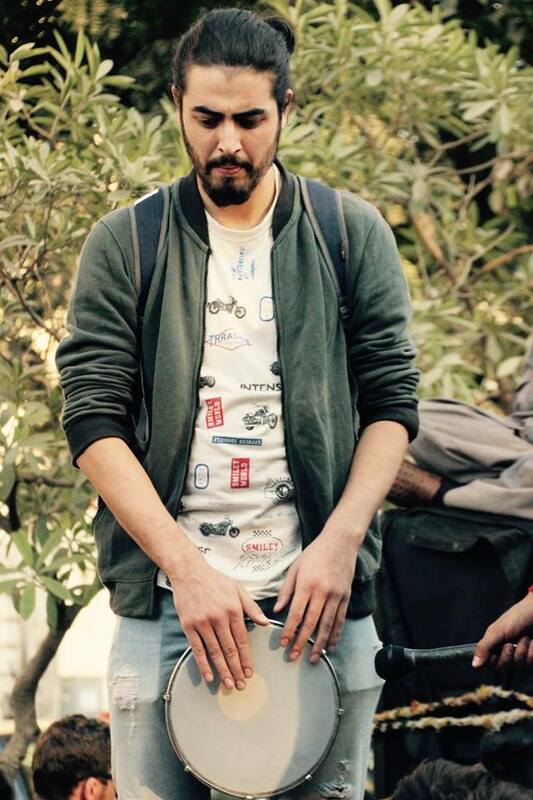 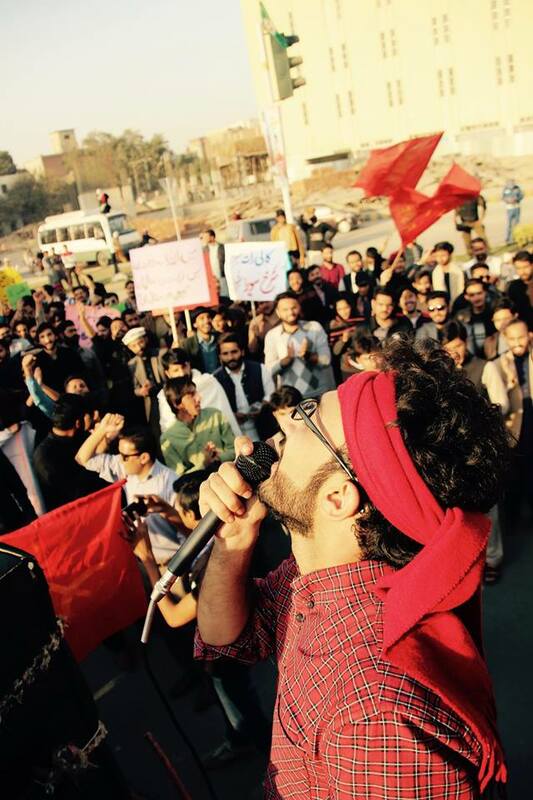 Many notable personalities came out on social media to express solidarity with their campaign. 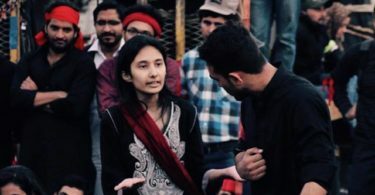 This includes Iqbal Lala (father of the late Mashal Khan), Bushra Gohar, Jalila Haider, Nida Kirmani, Ammar Rashid, Jibran Nasir, Farooq Tariq among others. 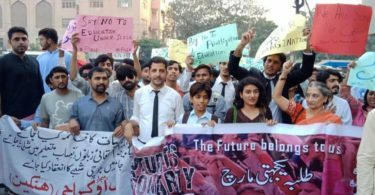 Students also raised their concerns on the paltry state of Pakistan’s education system in an open letter to Prime Minister Imran Khan, and ask for a clear response and immediate efforts toward remediating the crisis in education. 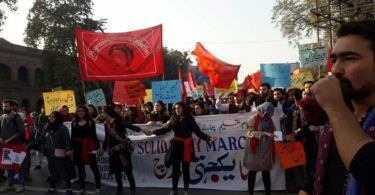 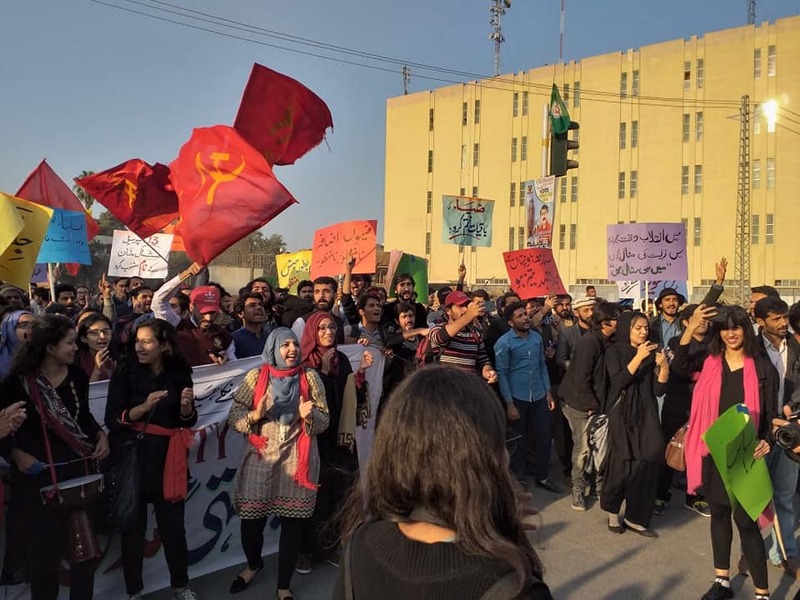 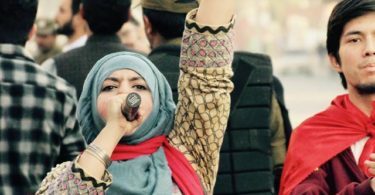 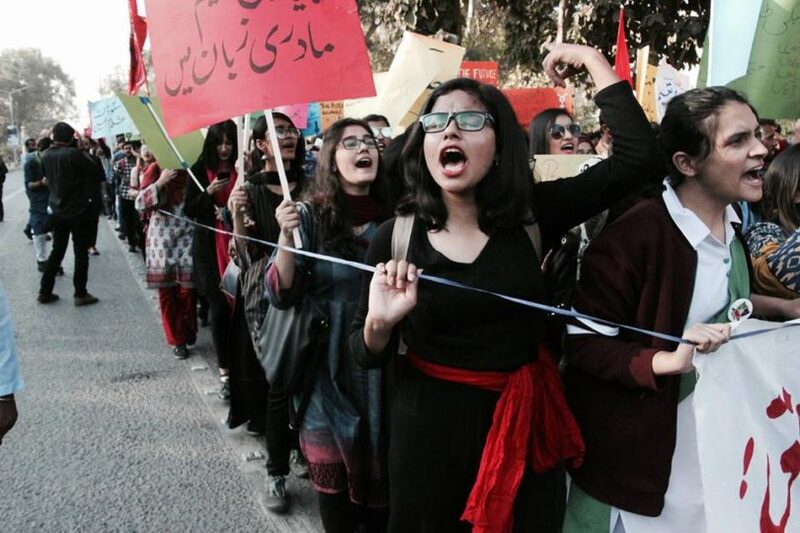 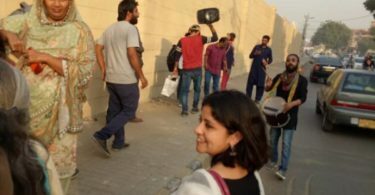 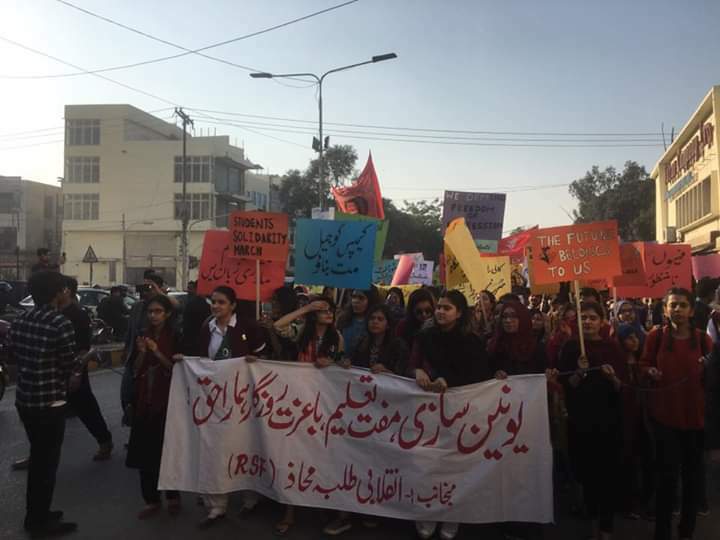 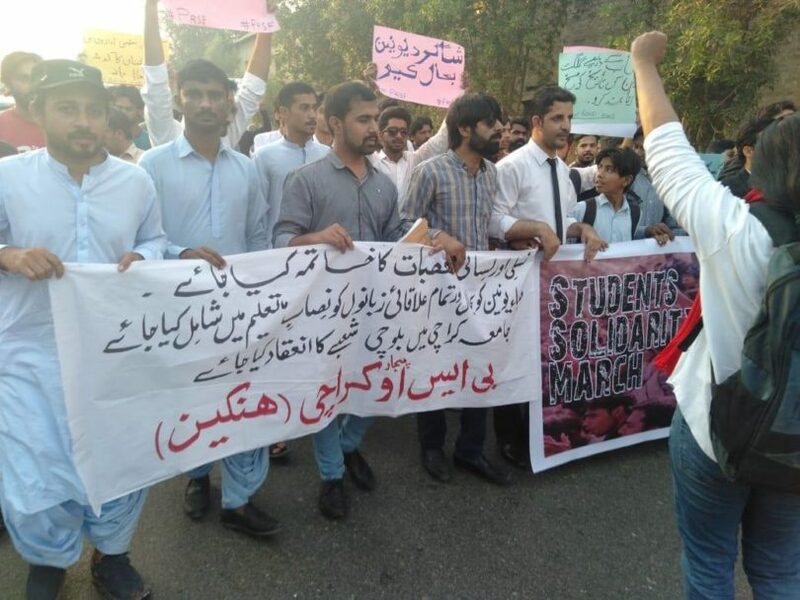 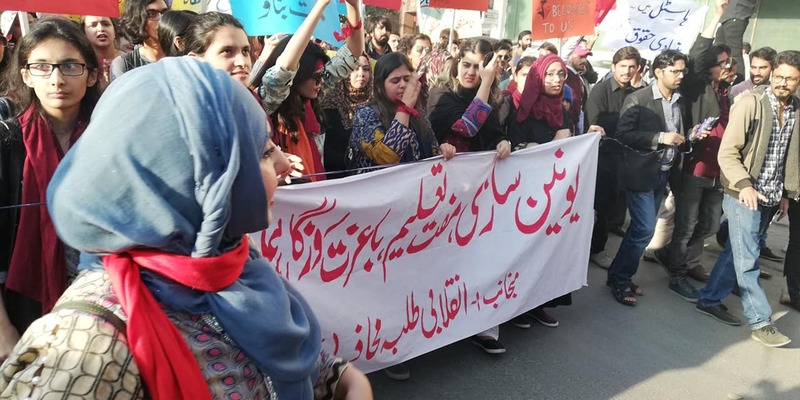 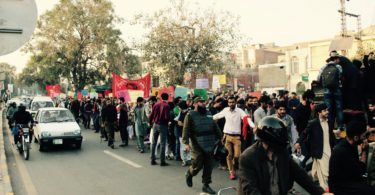 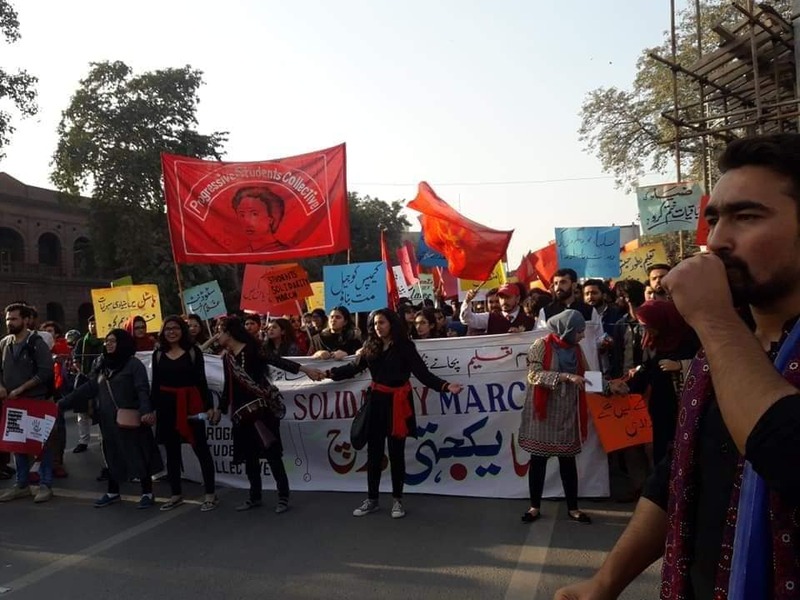 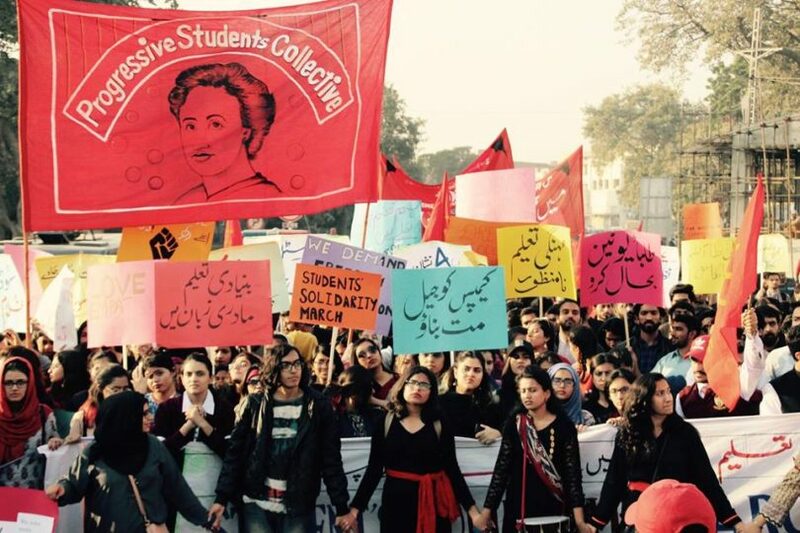 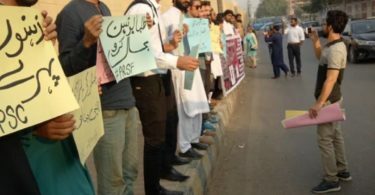 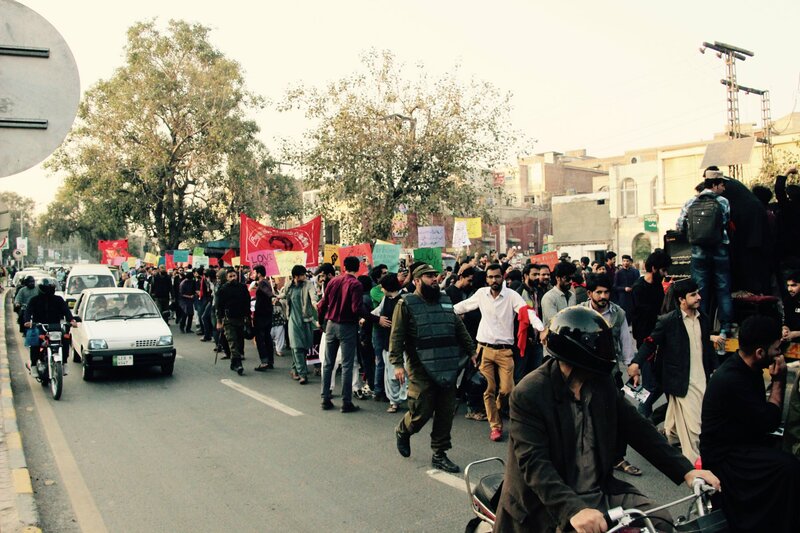 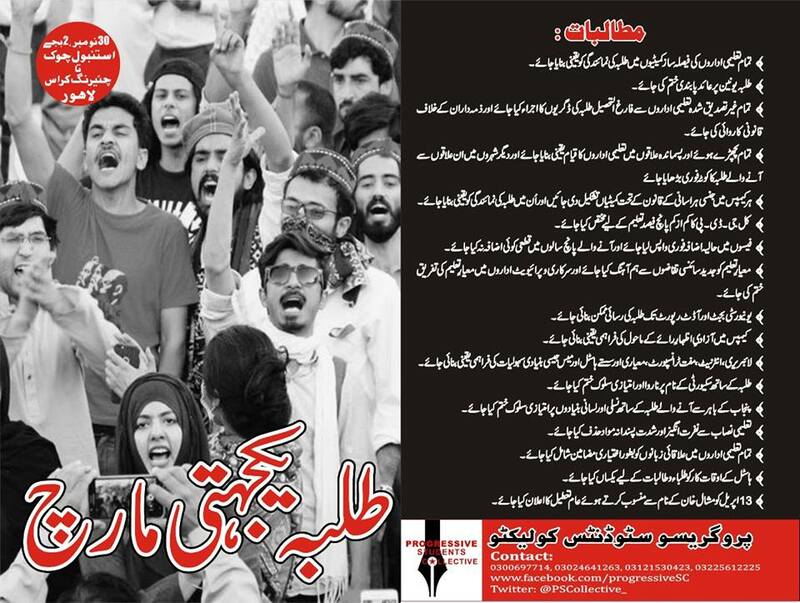 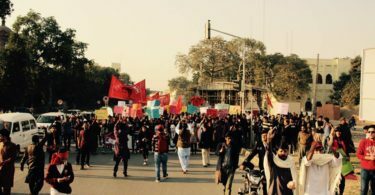 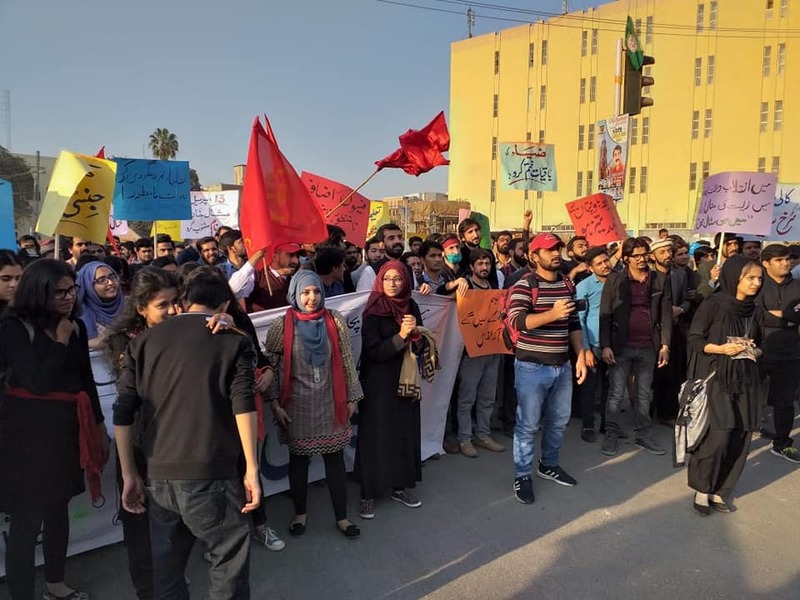 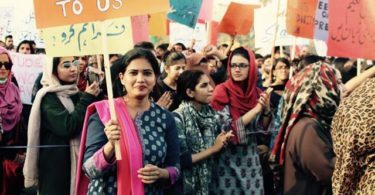 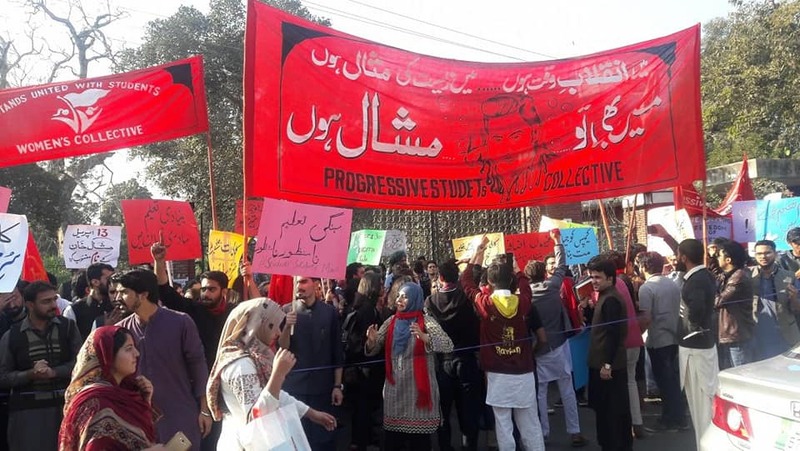 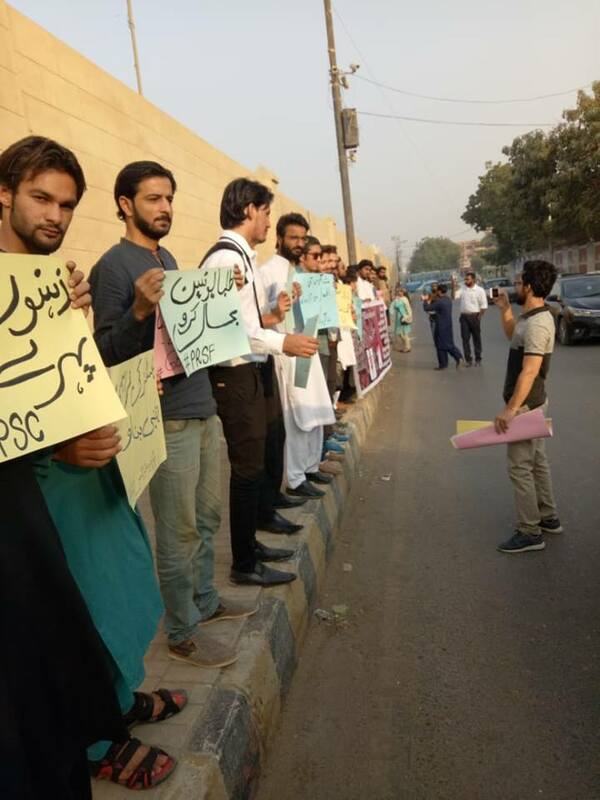 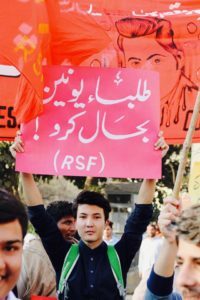 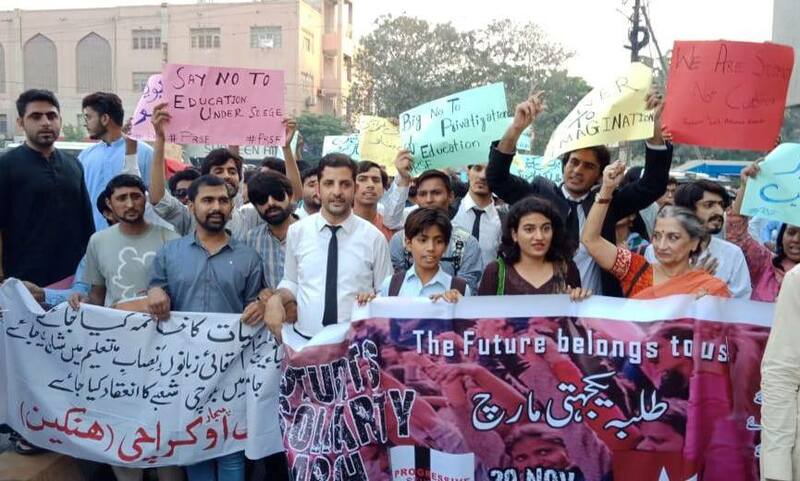 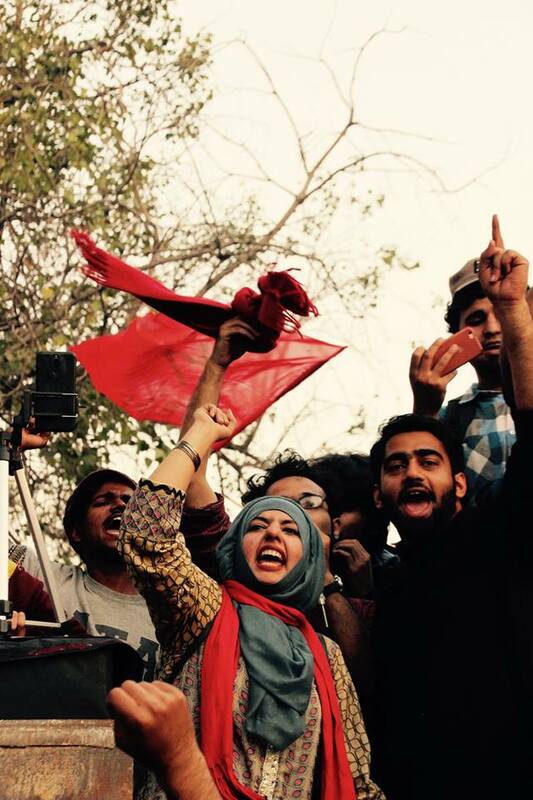 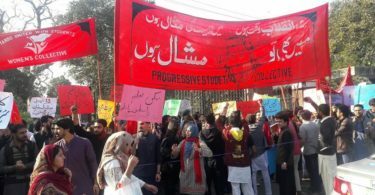 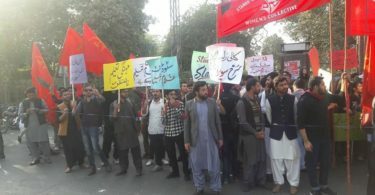 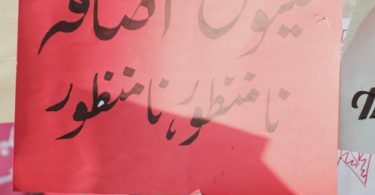 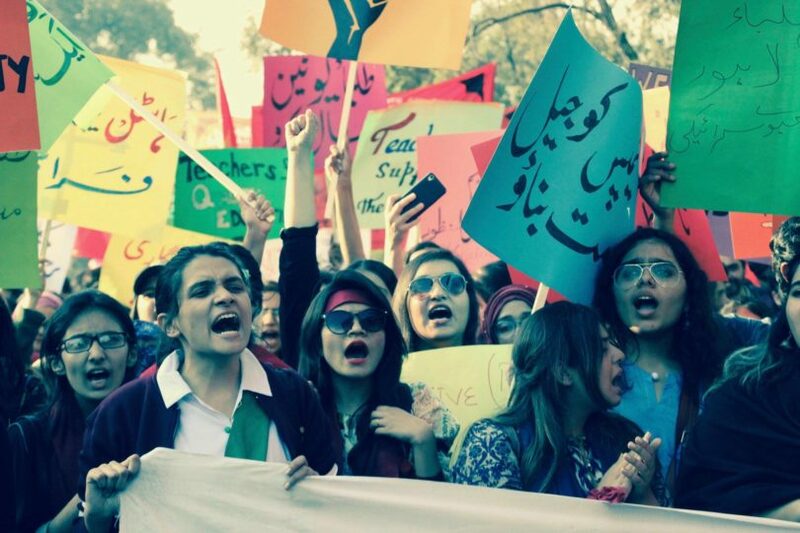 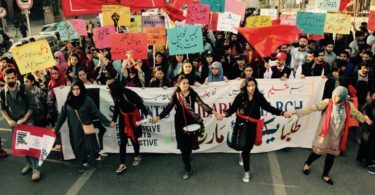 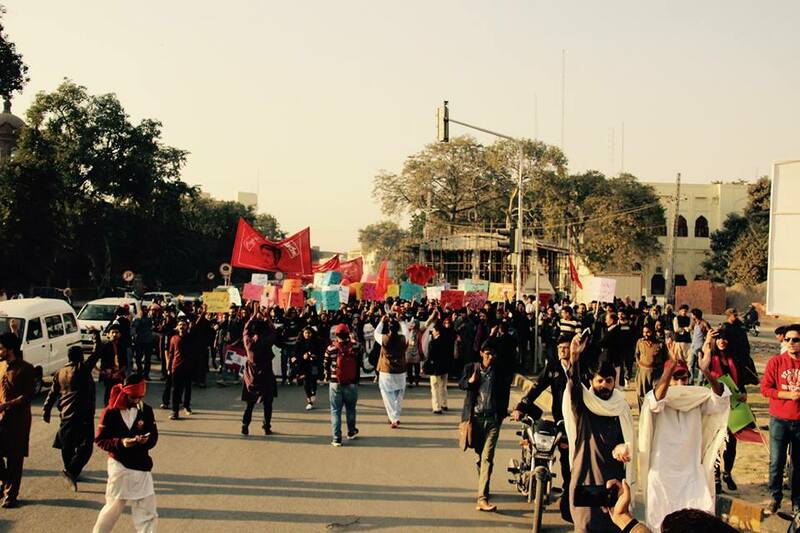 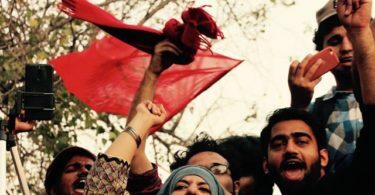 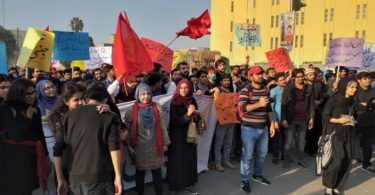 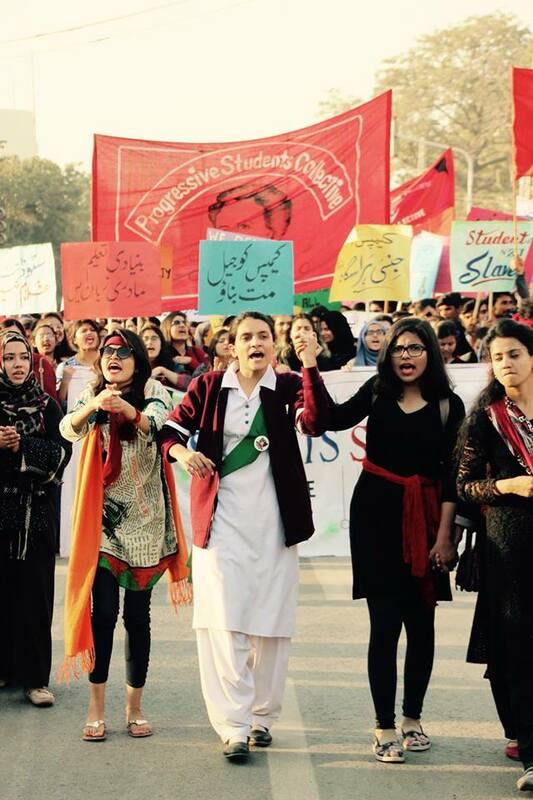 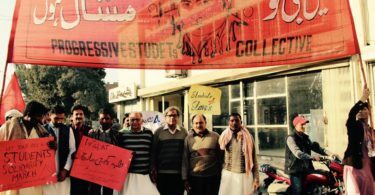 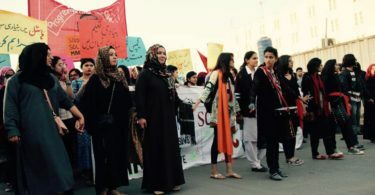 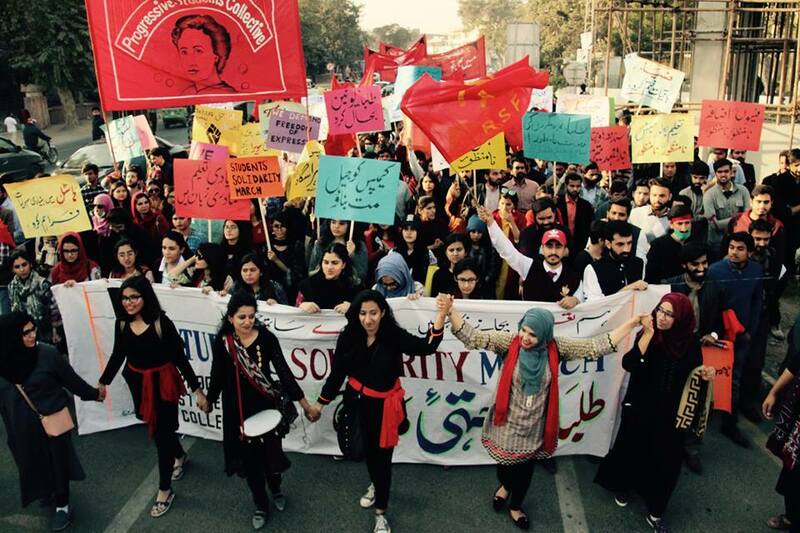 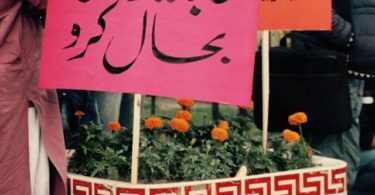 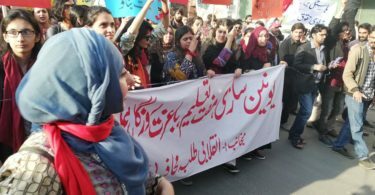 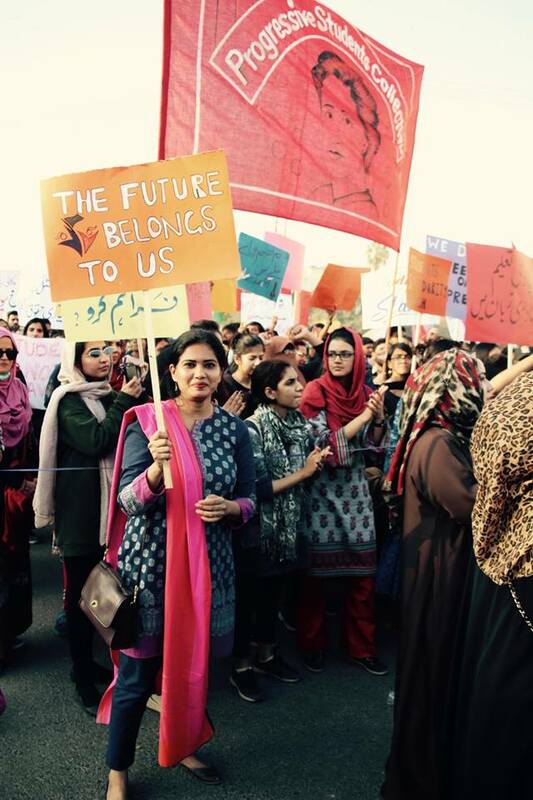 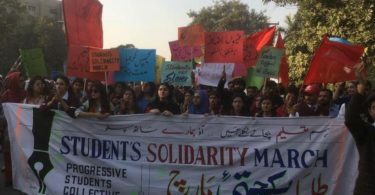 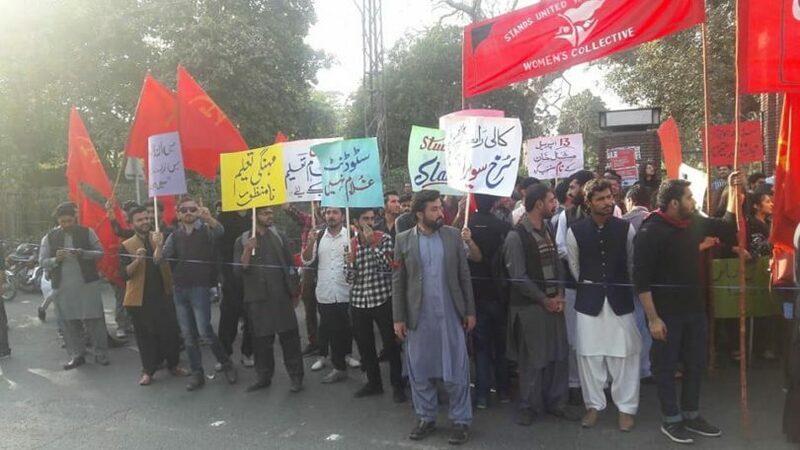 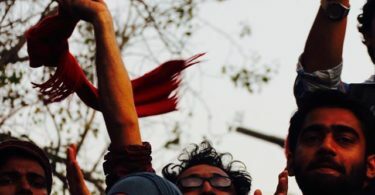 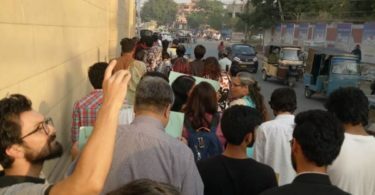 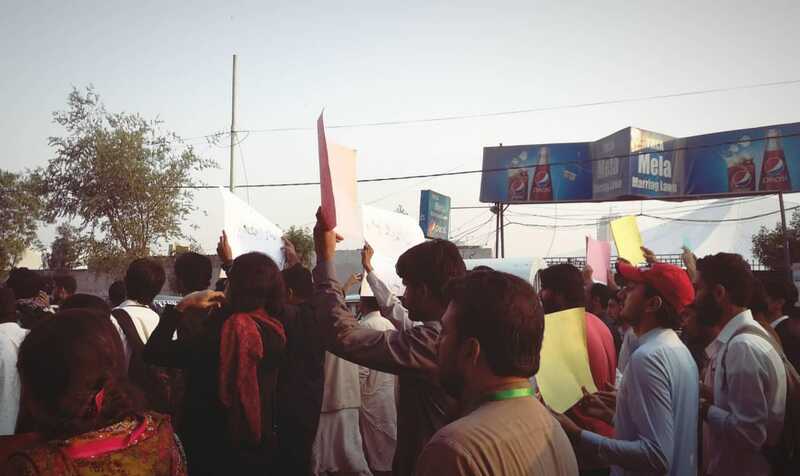 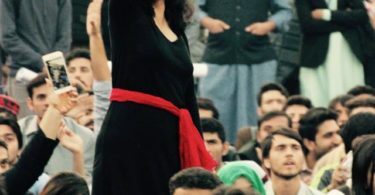 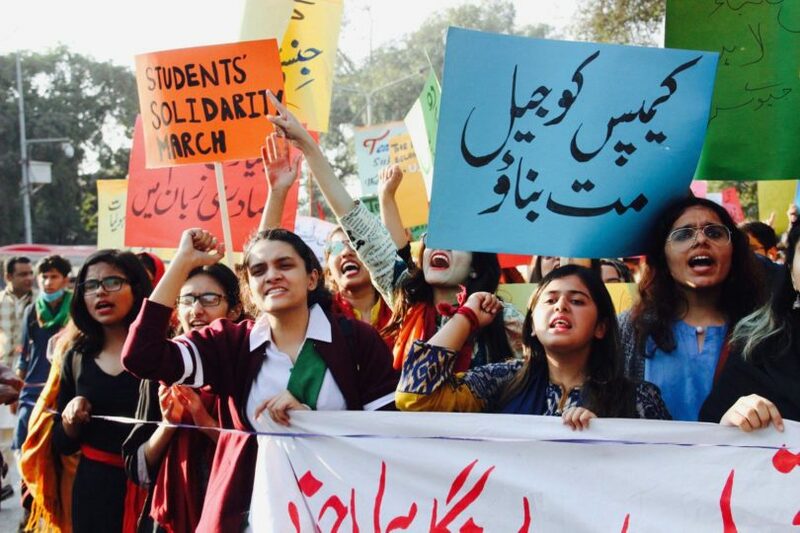 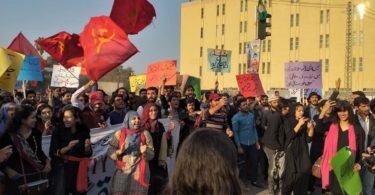 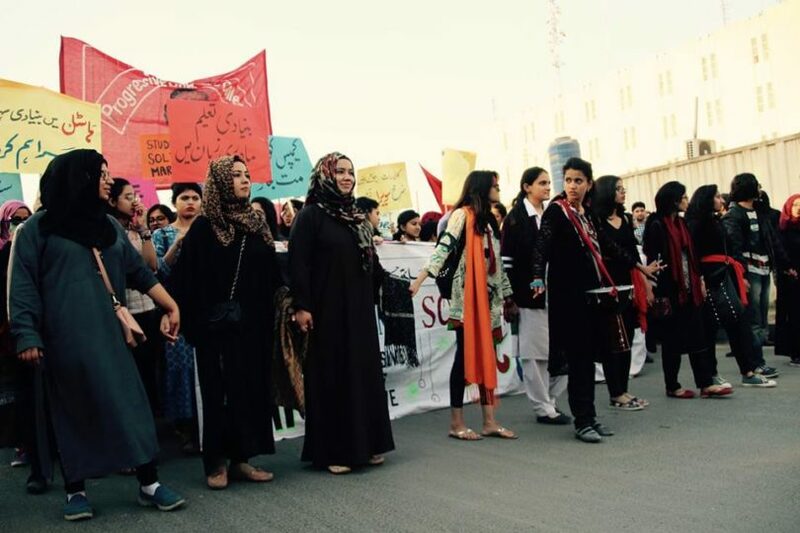 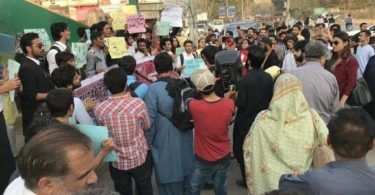 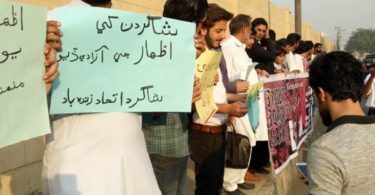 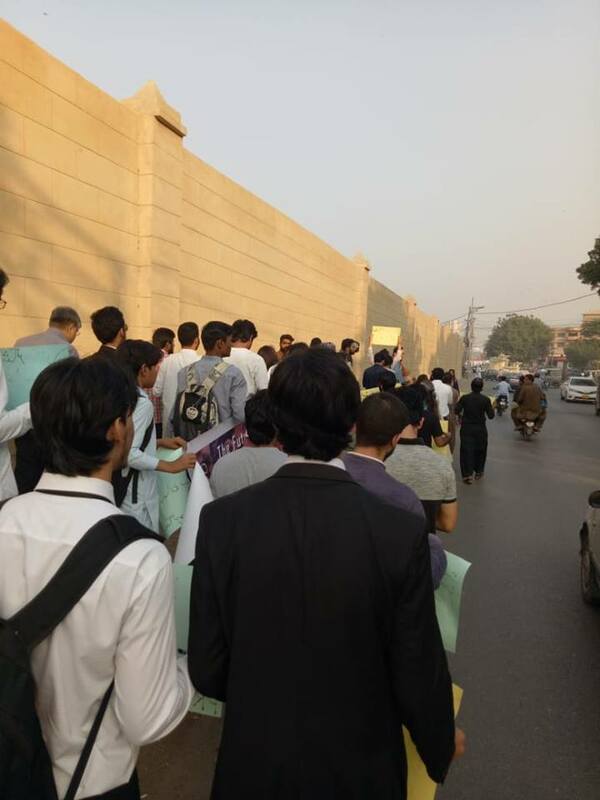 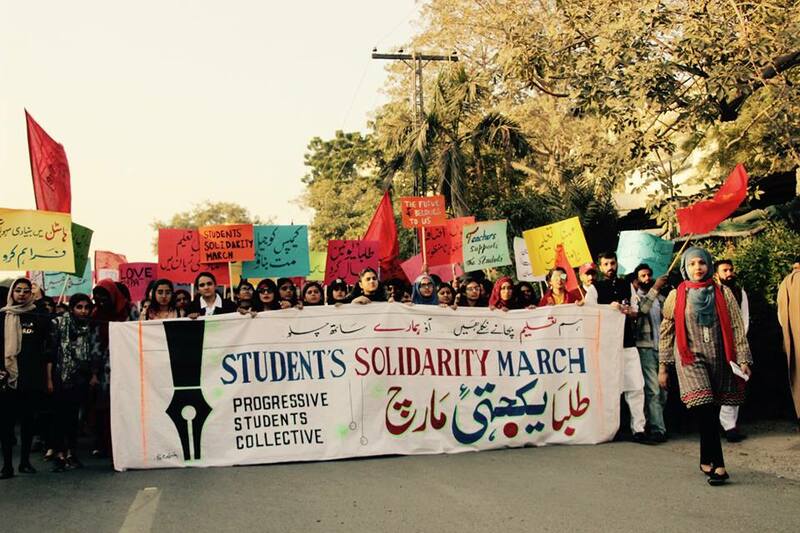 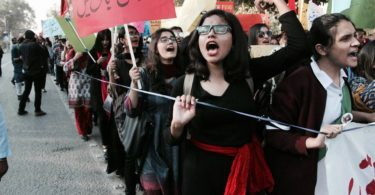 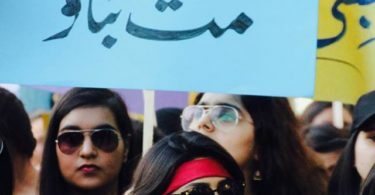 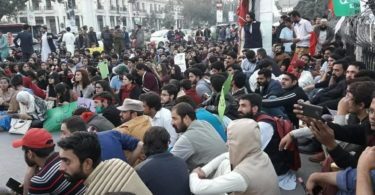 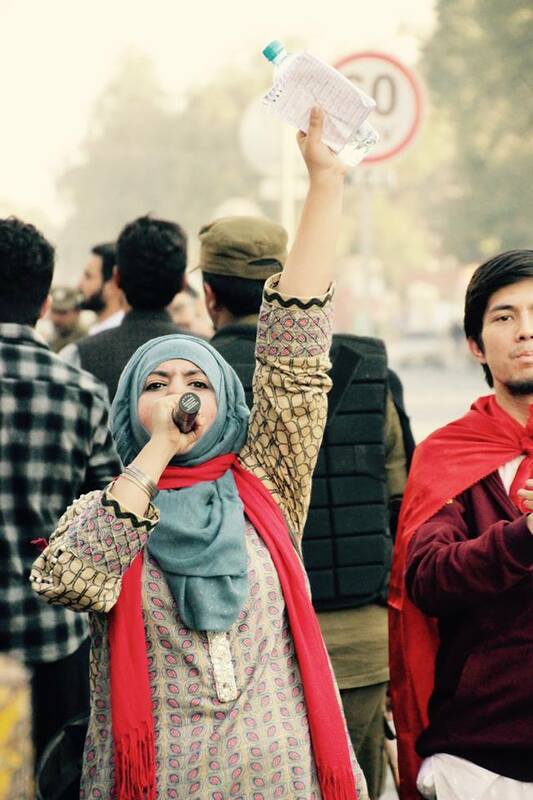 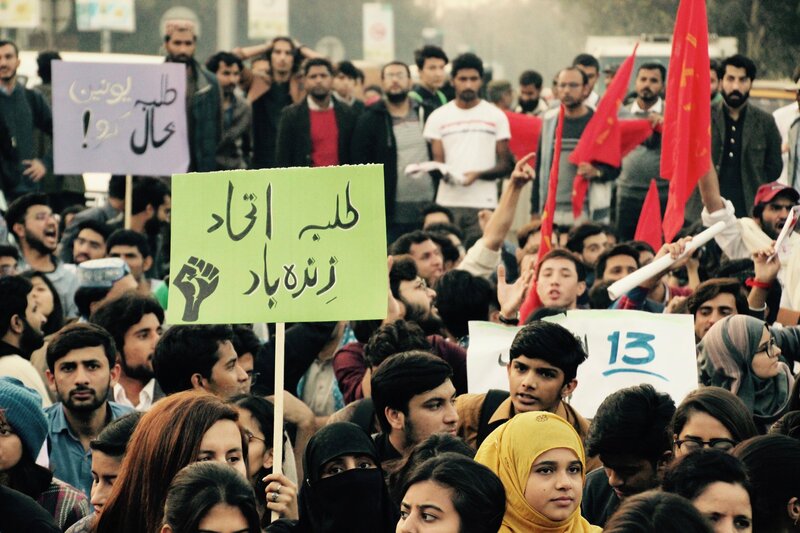 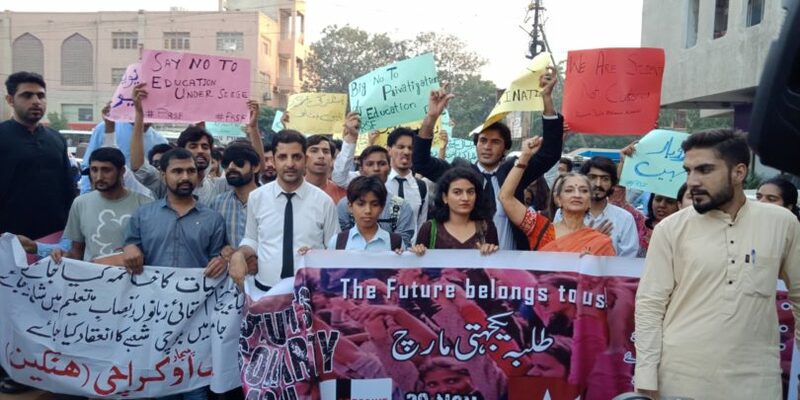 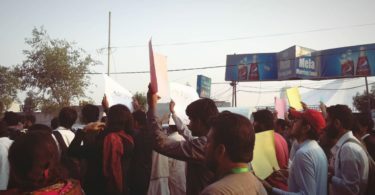 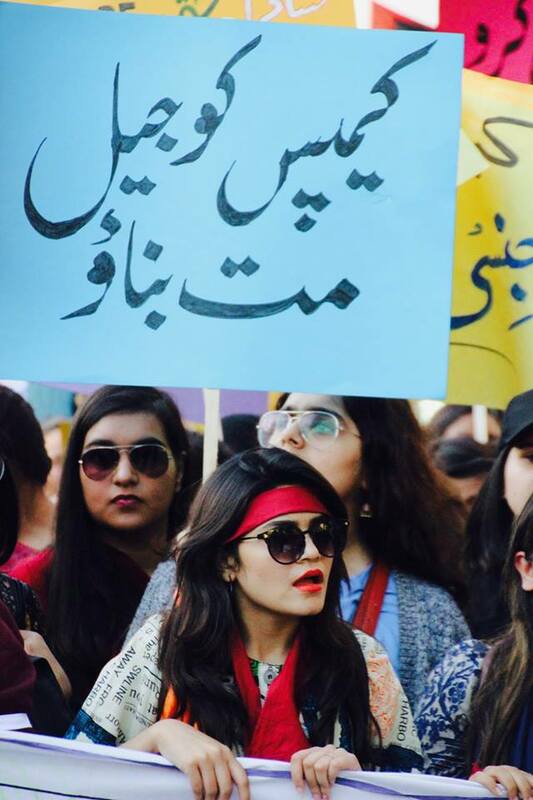 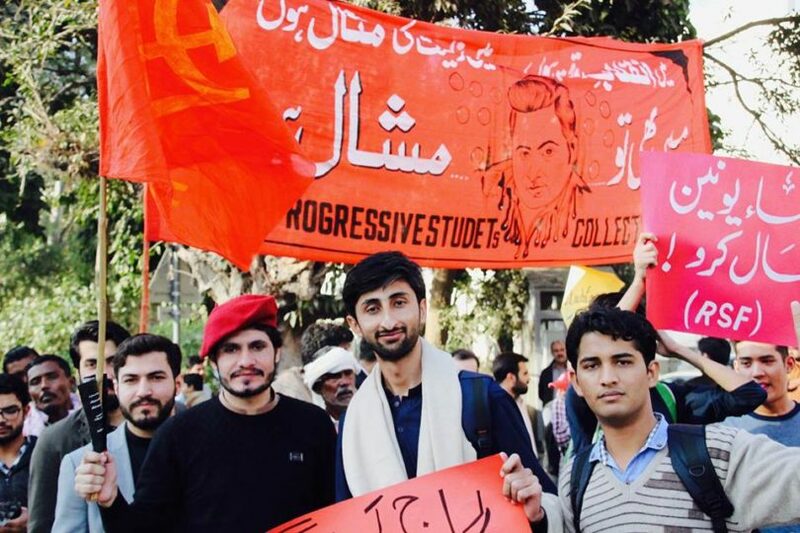 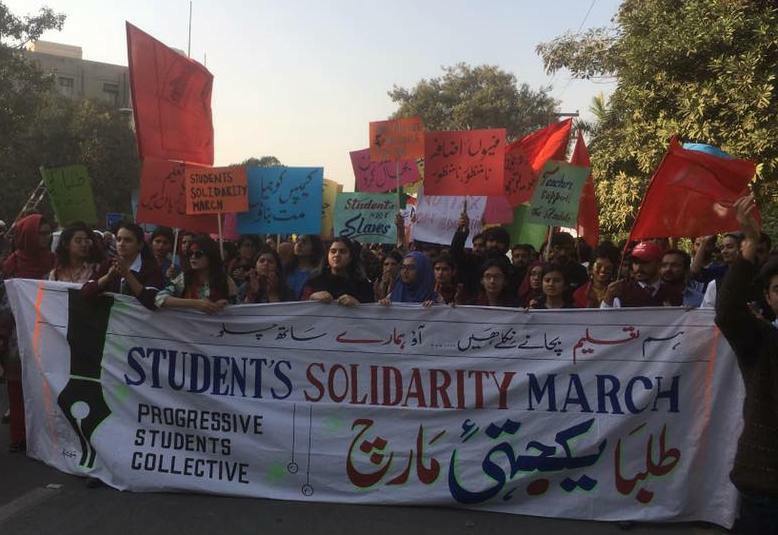 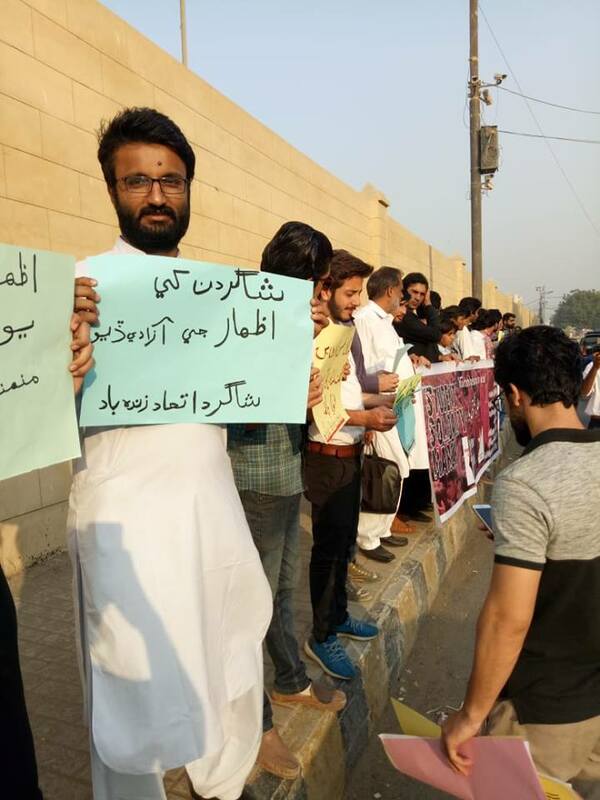 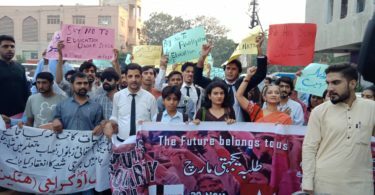 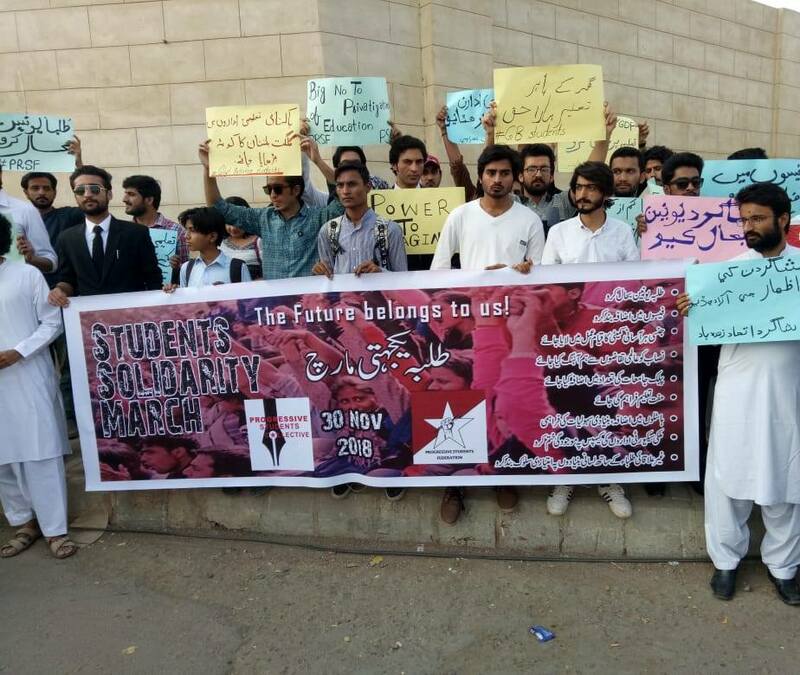 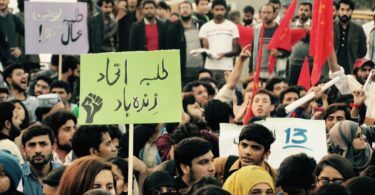 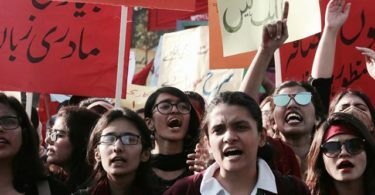 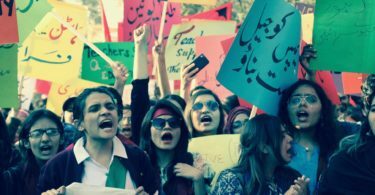 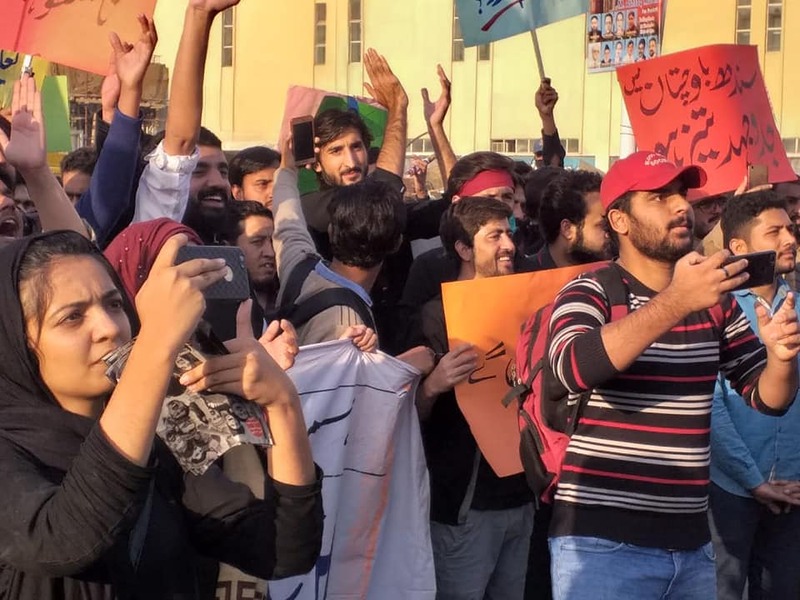 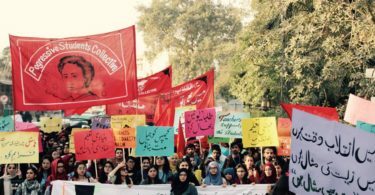 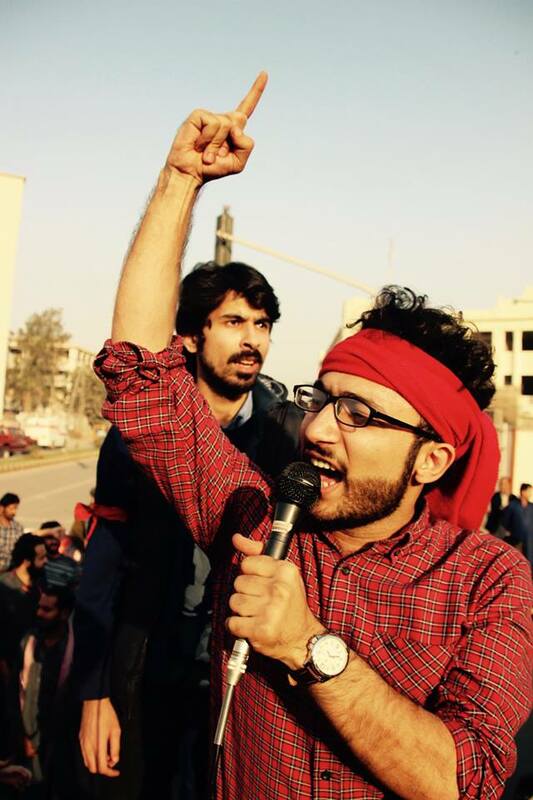 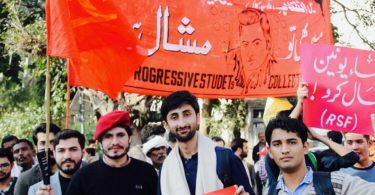 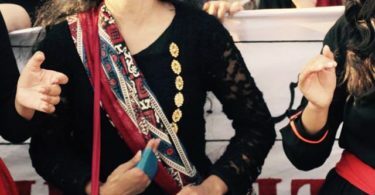 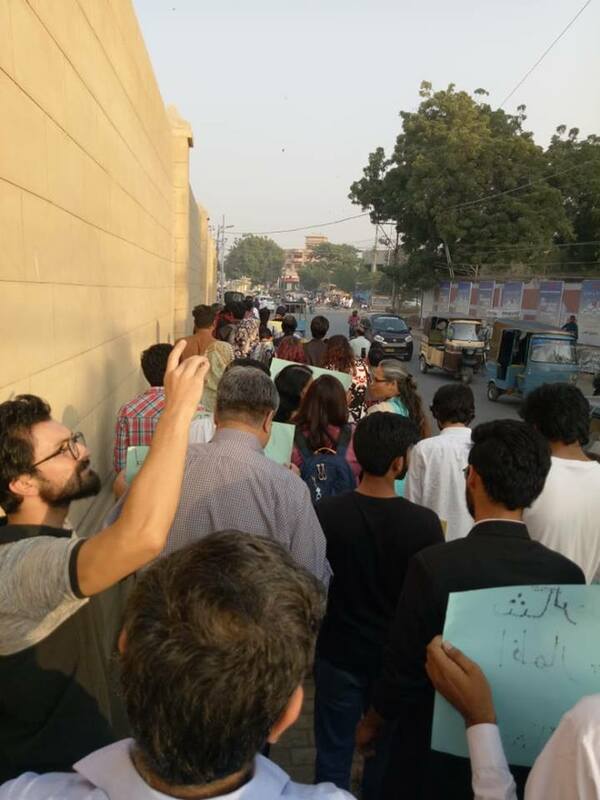 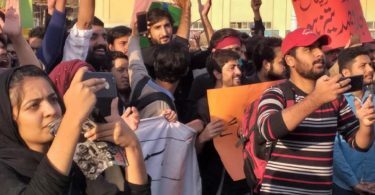 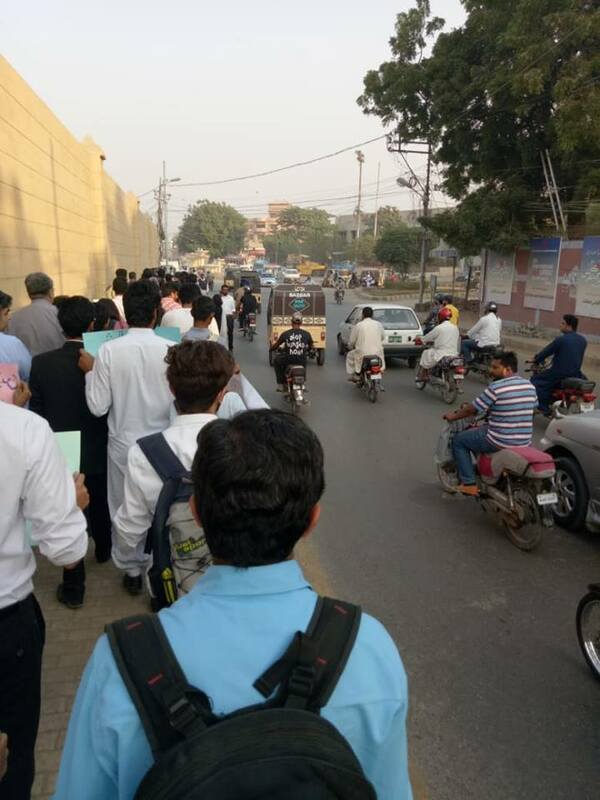 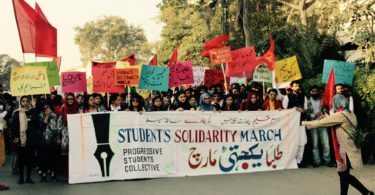 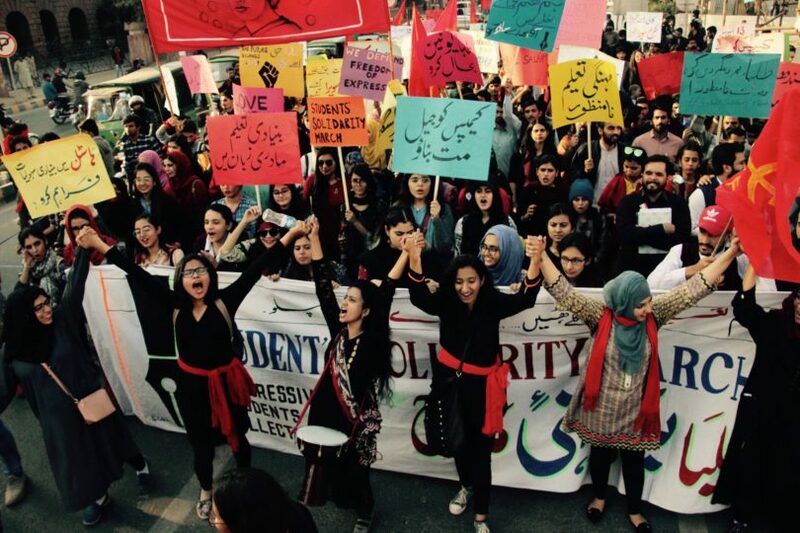 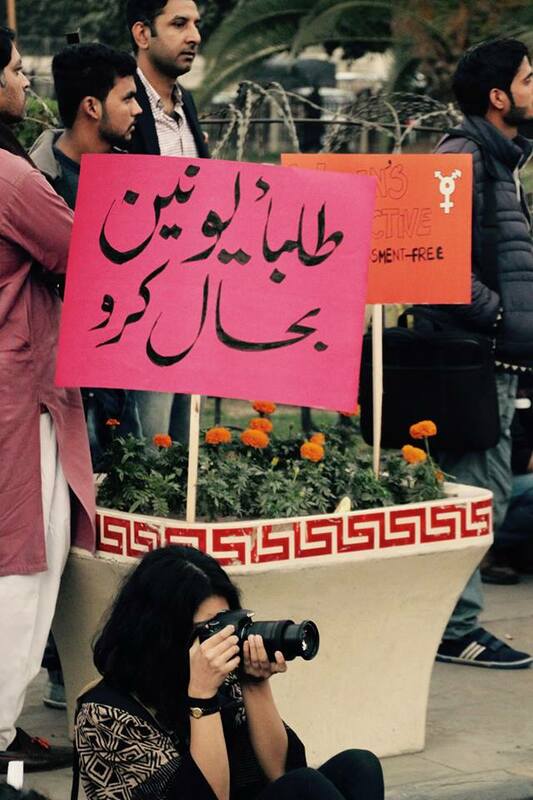 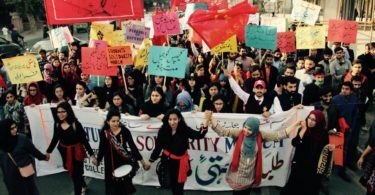 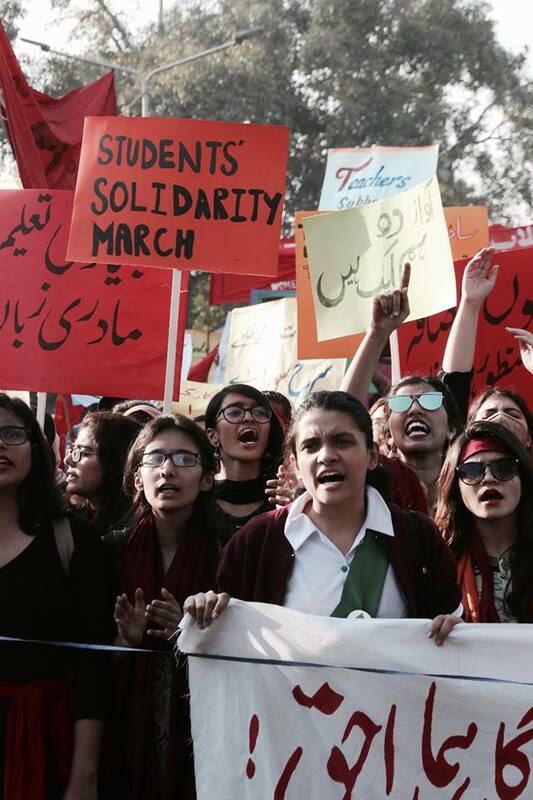 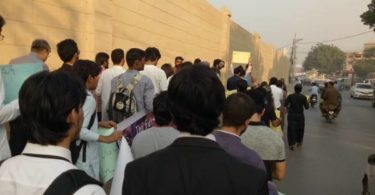 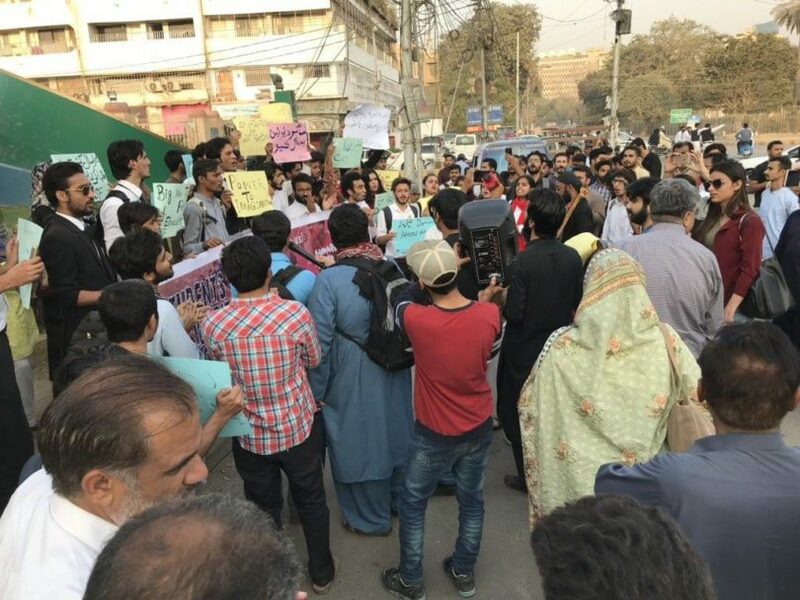 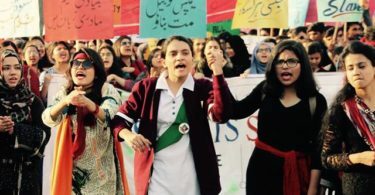 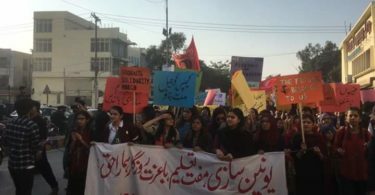 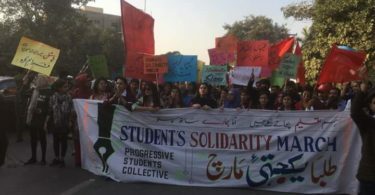 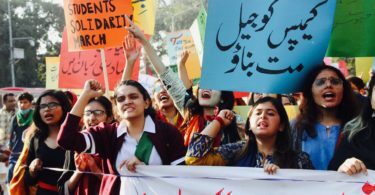 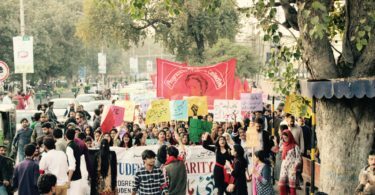 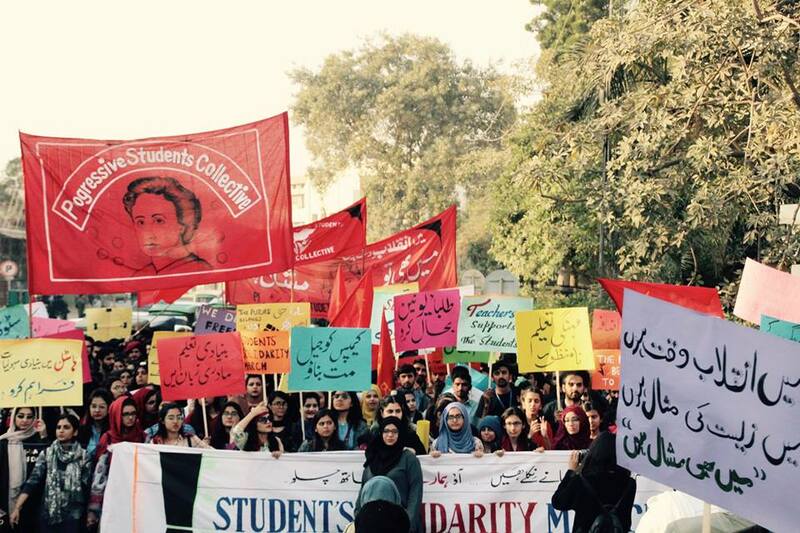 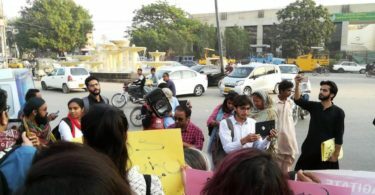 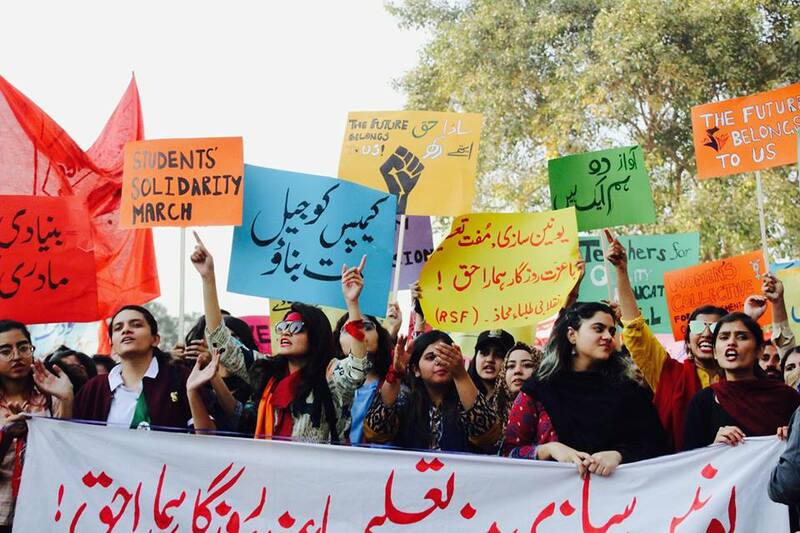 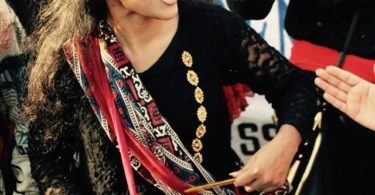 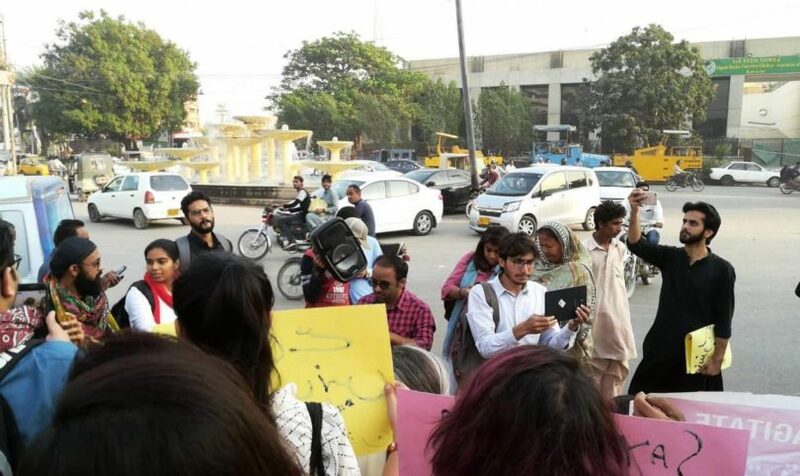 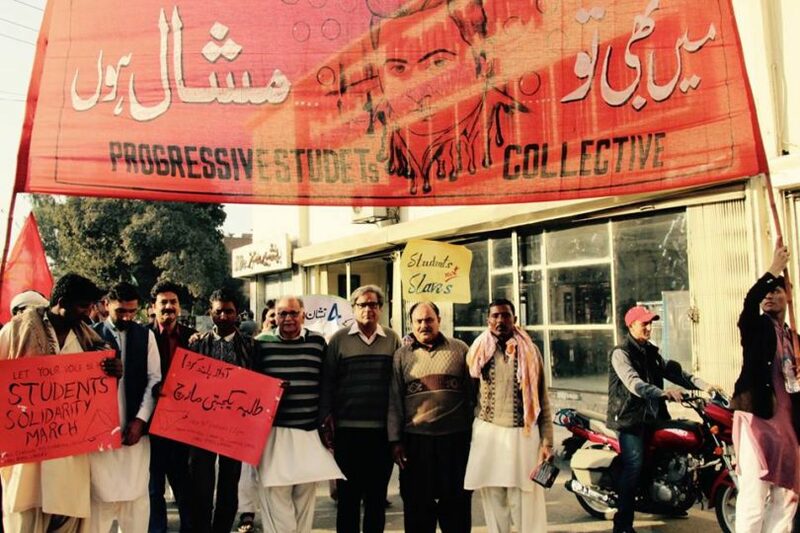 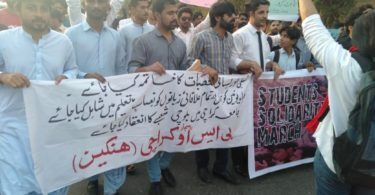 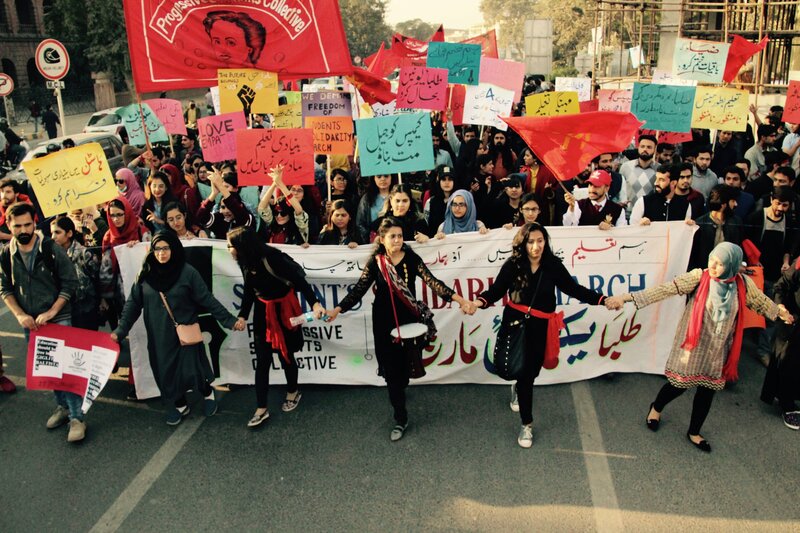 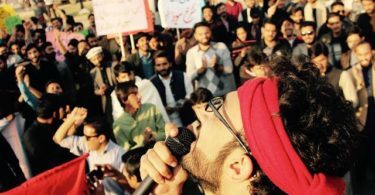 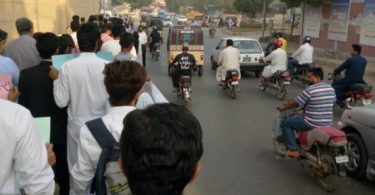 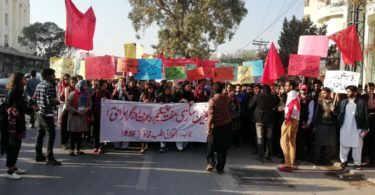 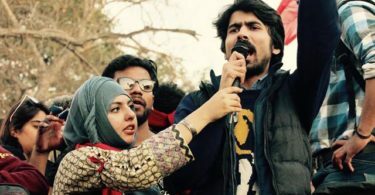 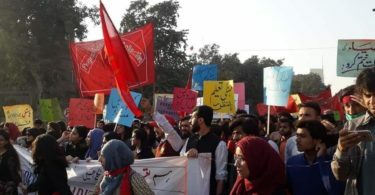 Solidarity marches were organised by student groups across the country, including in Islamabad, Quetta, Karachi, Gilgit-Baltistan, Hyderabad, Jamshoro, Khairpur, Kashmir and Multan.